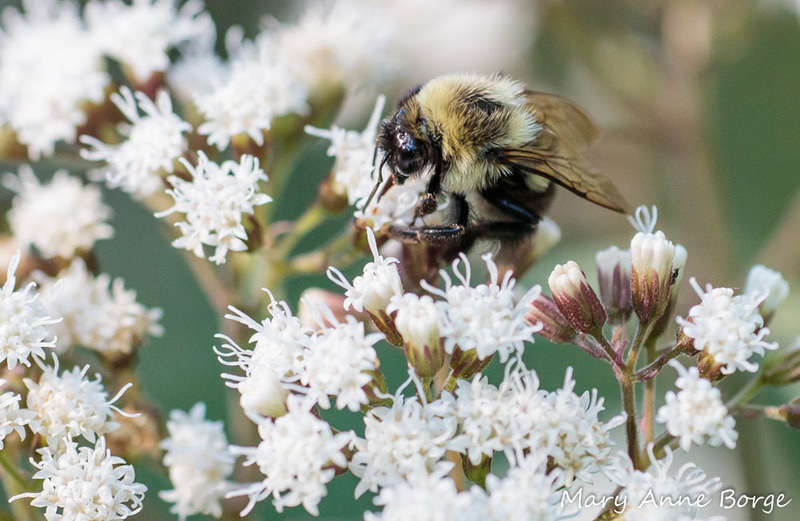 White Snakeroot (Ageratina altissima) provides food for late summer and fall visitors, primarily small critters. 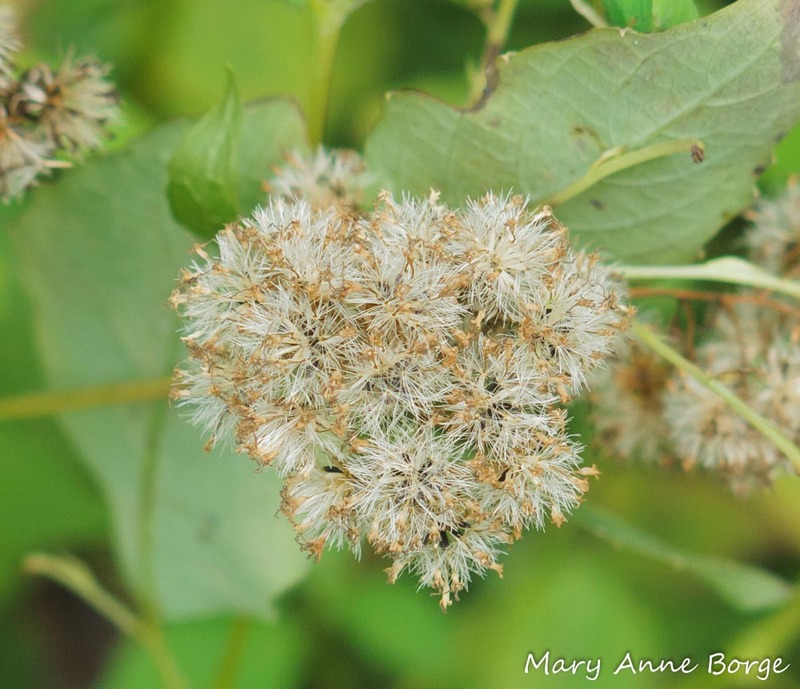 Its button-like clusters of tiny tubular flowers offer nectar to a variety of potential pollinators, and flower buds and leaves provide food for other insect diners. In my shade garden in central New Jersey, Bumble Bees and Small Carpenter Bees (Ceratina species) drink happily from the flowers. 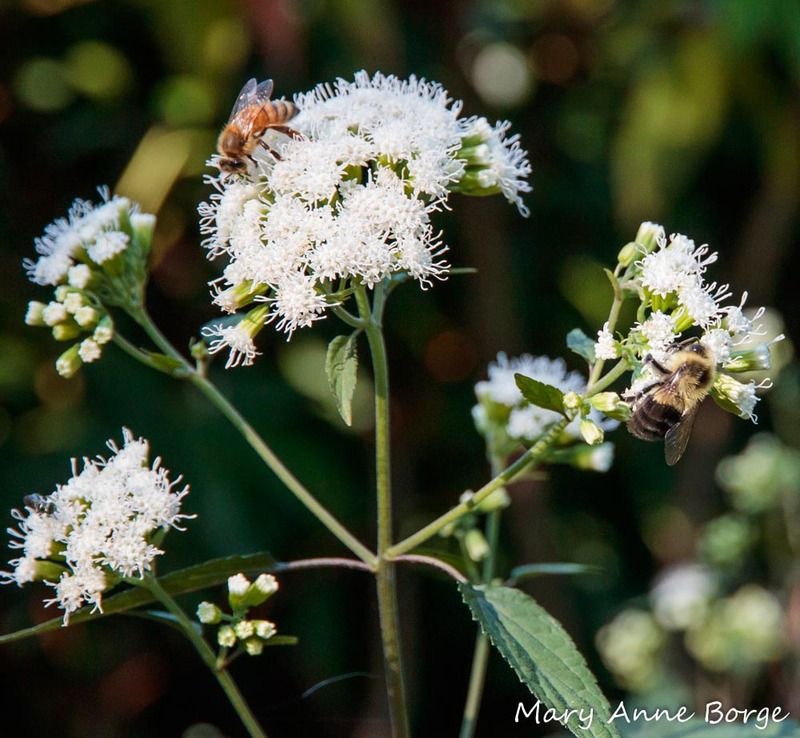 On a late September Sunday at Garden in the Woods in Framingham, Massachusetts, I watched while Bumble Bees and Honey Bees took advantage of White Snakeroot’s abundant nectar. 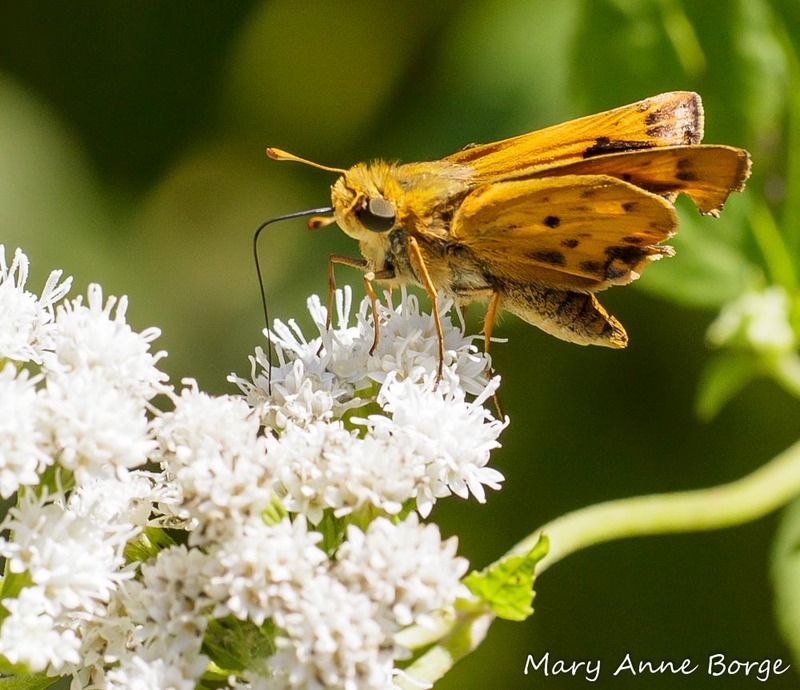 In a sunny woods-edge location at Bowman’s Hill Wildflower Preserve near New Hope, Pennsylvania, several butterfly species found needed nourishment in the nectar White Snakeroot flowers offered. 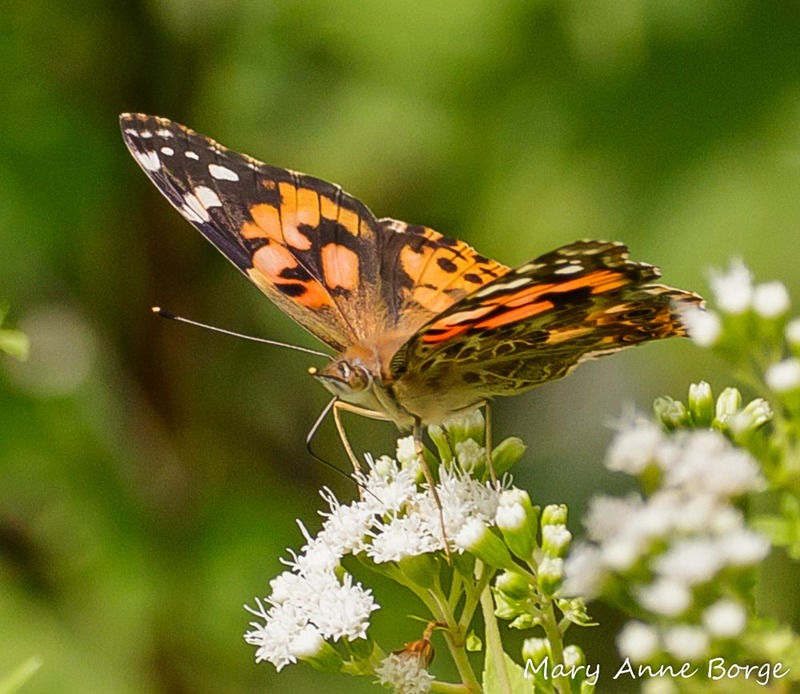 Painted Ladies and Sachem helped themselves to White Snakeroot’s sustaining beverage. 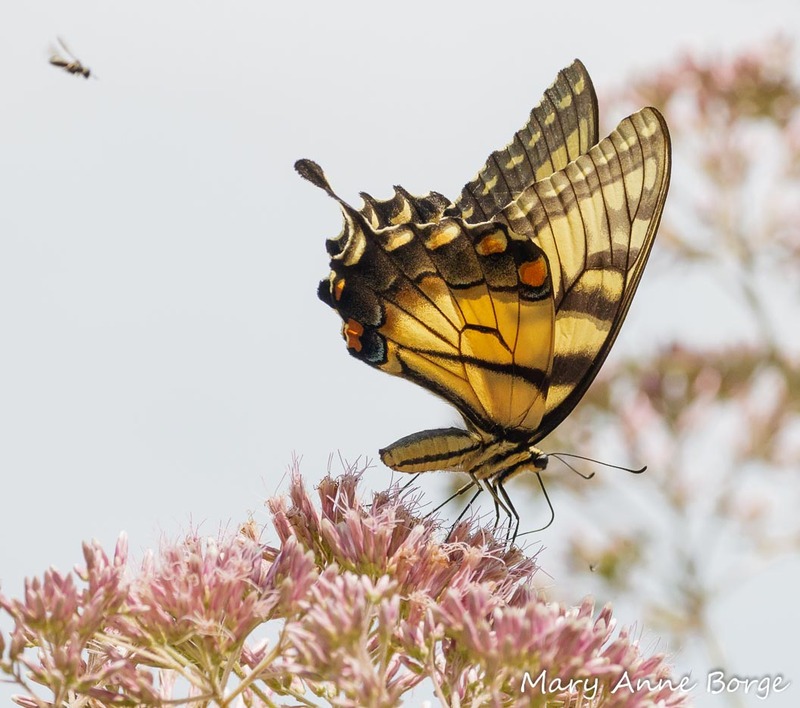 These butterflies have been around much of the summer and fall, drinking from the flowers in bloom, moving from one species to the next as the season changed. 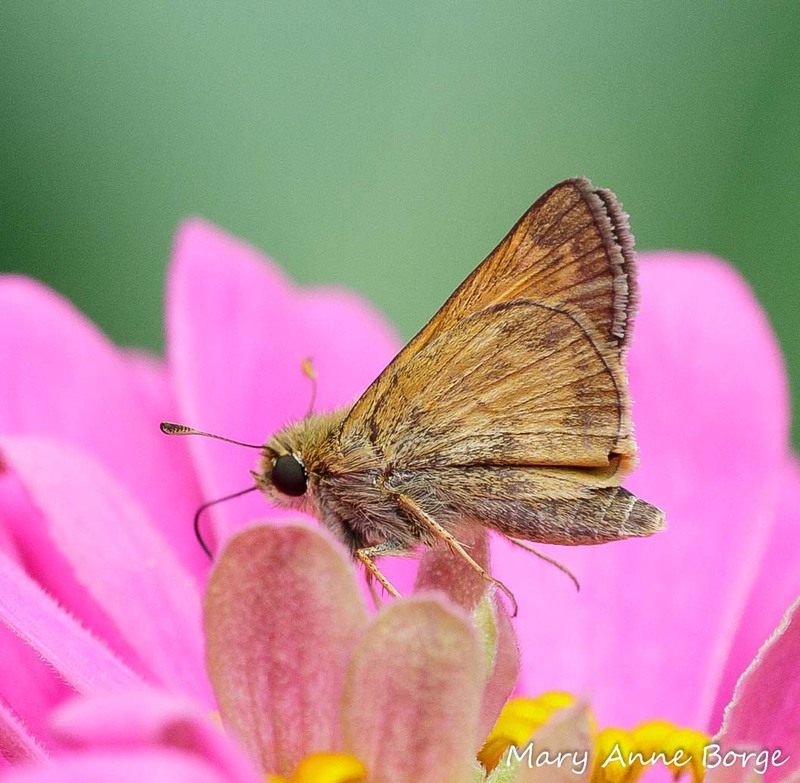 I was excited to see a Fiery Skipper, a butterfly that is rare in Pennsylvania, but a common resident in the southern United States. Fiery Skippers are among the butterfly species that regularly attempt to push the envelope of their range by emigrating to the north. 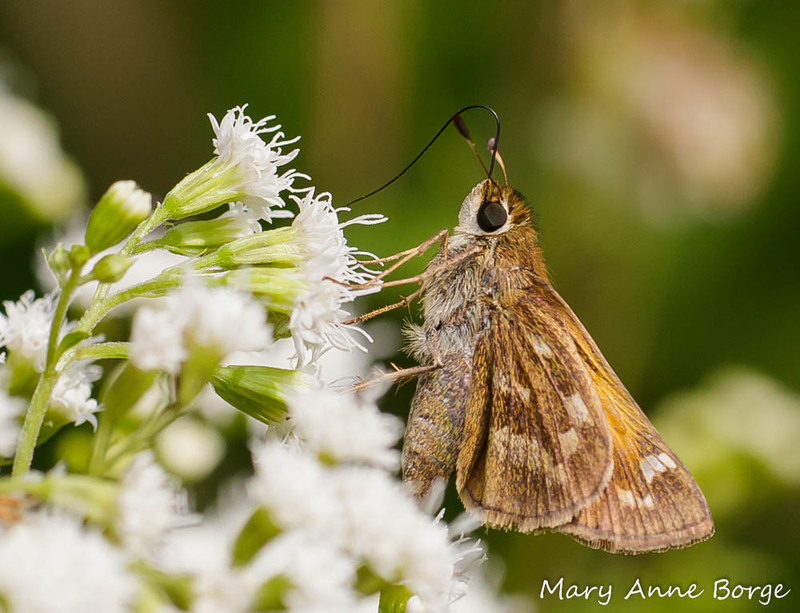 White Snakeroot’s refreshing nectar rewarded this individual for its exploration efforts. 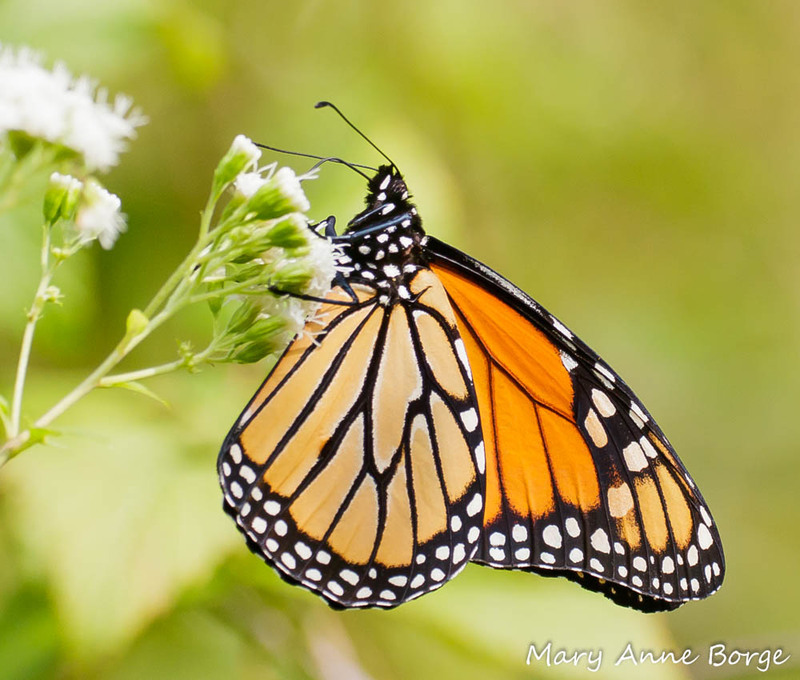 Meanwhile, a Monarch fueled up for a flight in the opposite direction, heading south towards its winter territory in Mexico. 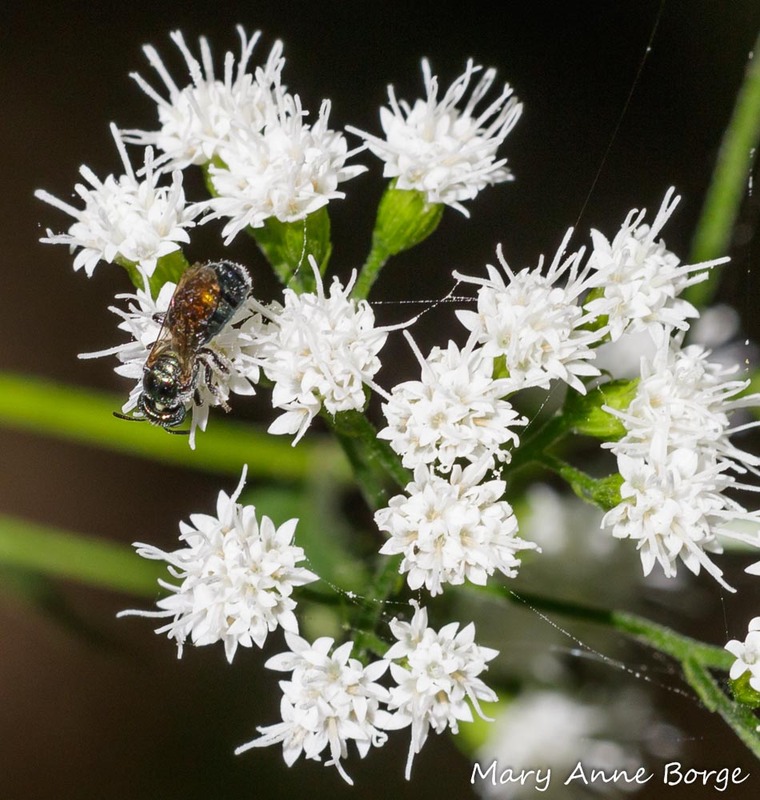 If these potential pollinators do the job for which White Snakeroot has enticed them to visit its flowers, pollination occurs, and a type of fruit, called an achene, develops. 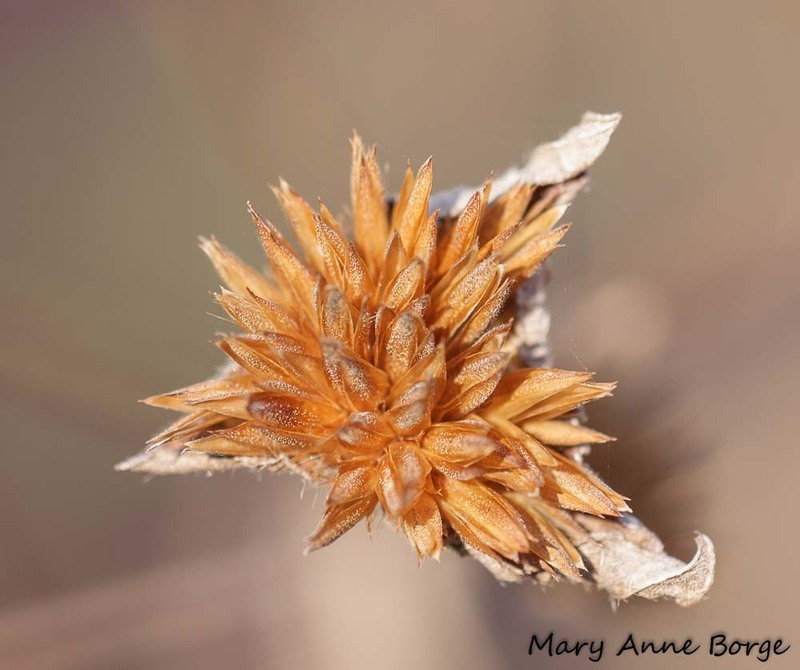 The achene looks like a seed with a tiny hair-like parasol attached, designed to be dispersed by the wind to a favorable place for another White Snakeroot plant to germinate and grow. 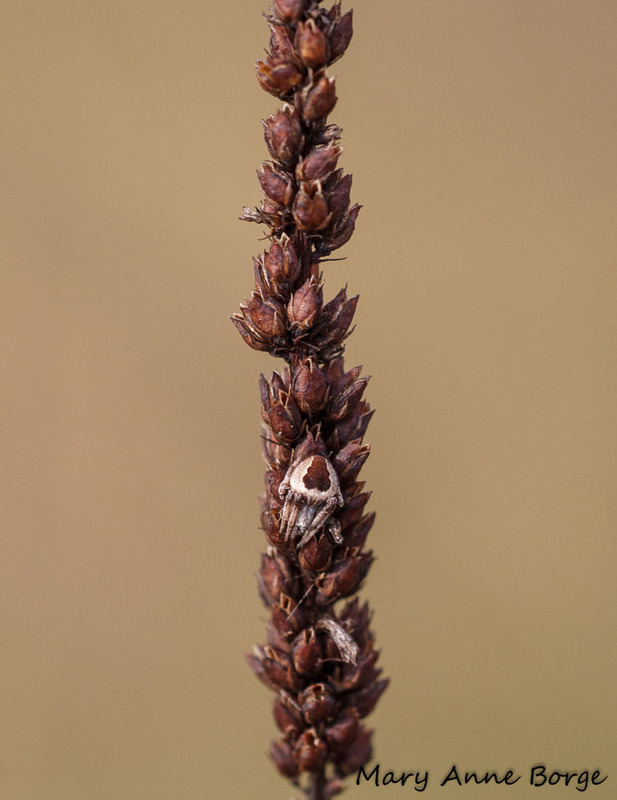 At Bowman’s Hill Wildflower Preserve, an insect that looked a bit like a stink bug turned out to be the opposite – Harmostes fraterulus, one of the scentless plant bugs. 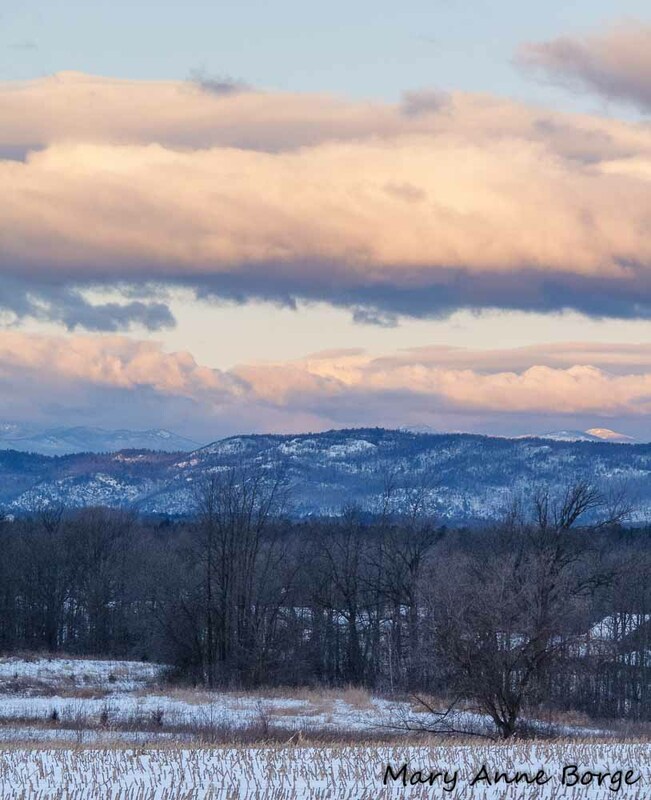 Pennsylvania is thought to be the northern edge of Harmostes fraterulus’s range. 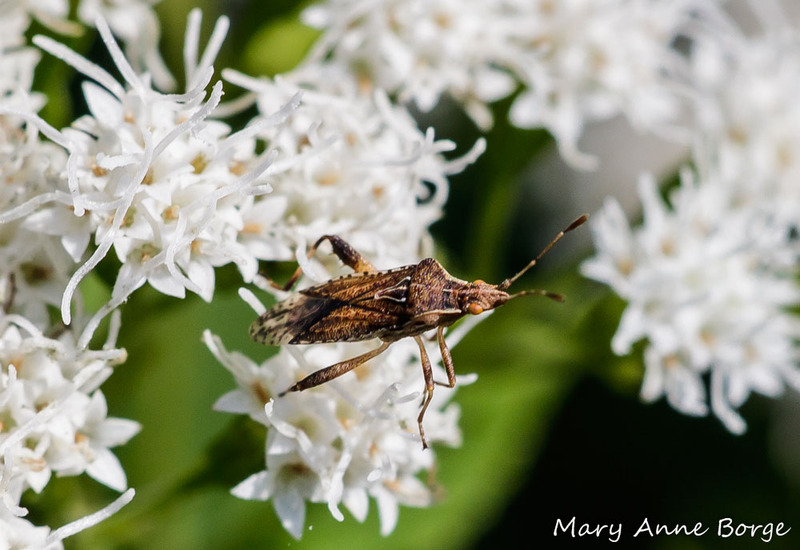 Scentless plant bugs are a group of true bugs that lack glands to produce an unpleasant smell, quite unlike stink bugs who are named for their ability to do this. 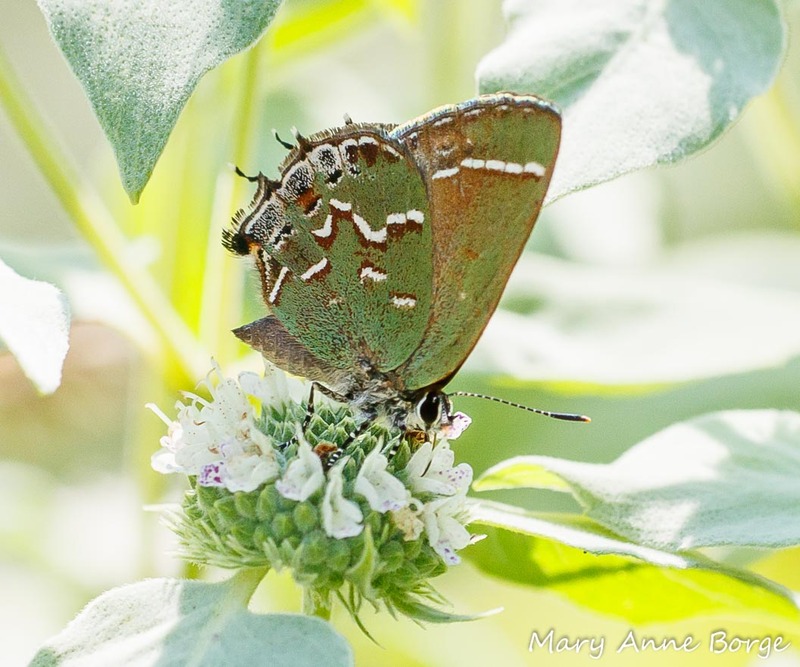 Harmostes fraterulus feeds on the flowers of several Aster (Asteraceae) family members, of which White Snakeroot is one. 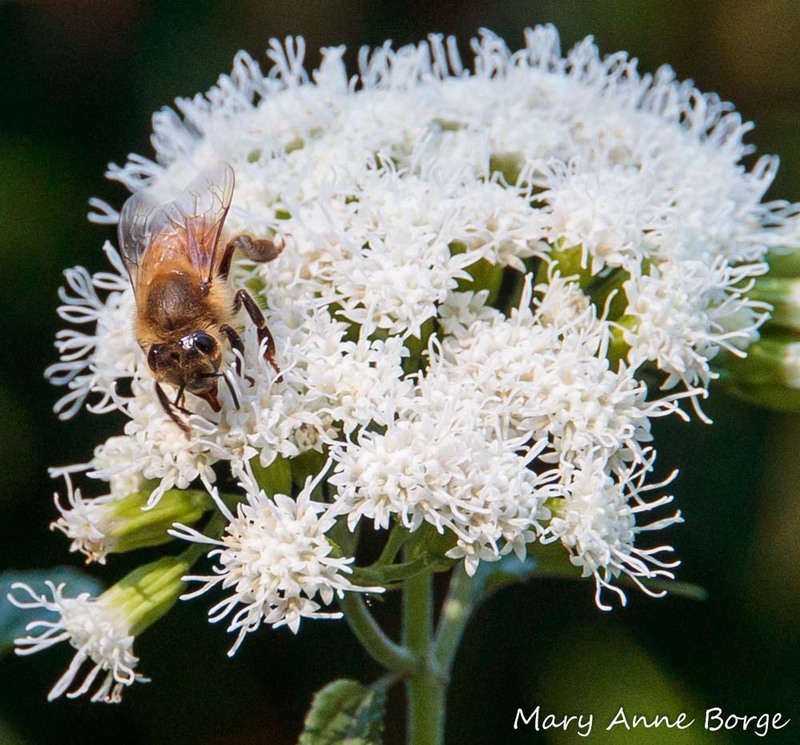 It’s interesting that this small insect is able to eat parts of White Snakeroot, since this plant contains potent toxins evolved to prevent herbivores from consuming it. These toxins are so effective that they can be fatal to mammals. As you might guess, deer do not eat this plant. If cows graze on a sufficient amount of White Snakeroot, the milk they produce is toxic to humans. In the nineteenth century, many people became sick or even died as a result of drinking this tainted milk, most famously, Abraham Lincoln’s mother. 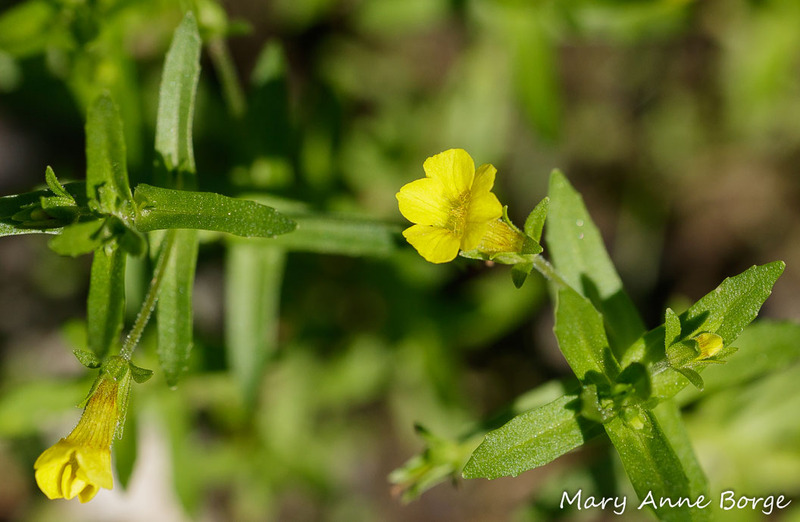 While this plant’s chemical defenses are potent enough to sicken or even kill large mammals, some tiny insects have successfully adapted to use this plant as their food source (host plant). 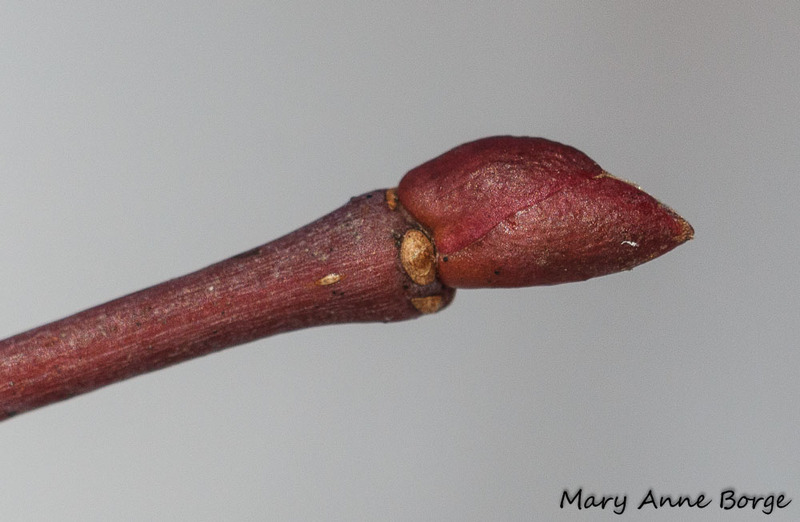 A type of small fly species, a midge named Schizomyia eupatoriflorae, specializes on White Snakeroot buds. 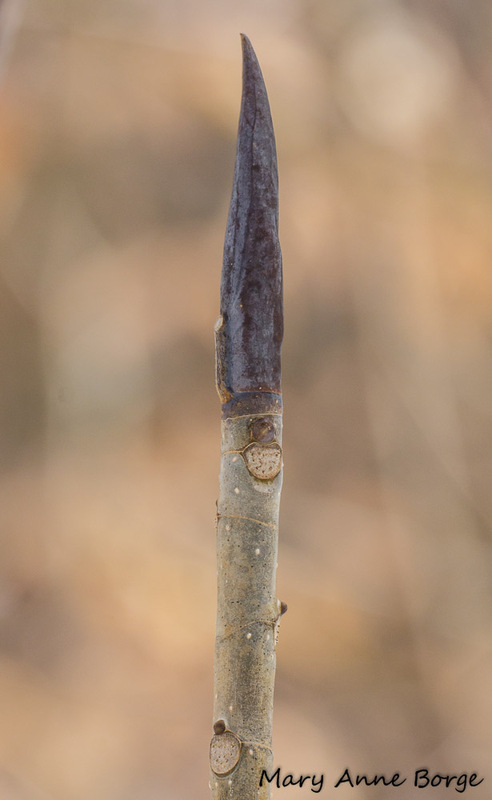 The larvae of this midge live inside the plant tissue, prompting the plant to produce a rounded gall that the developing midge uses for both food and shelter until it is ready to emerge as an adult. Flowers often have a lower concentration of a plant’s chemical defenses than do the other plant parts such as leaves and stems. But there are even insects who have evolved to specialize on White Snakeroot’s leaves. 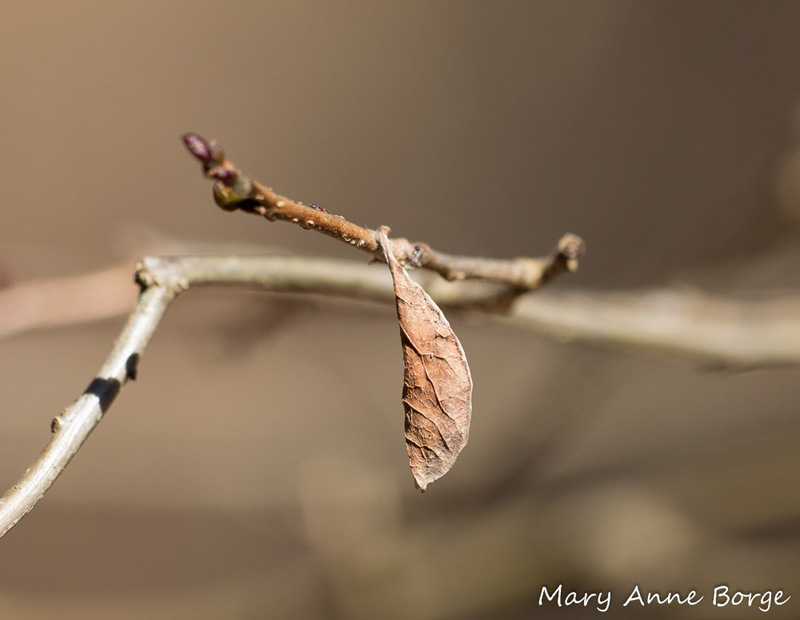 The one of which I most often see evidence is a leaf miner, Liriomyza eupatoriella, a type of fly. 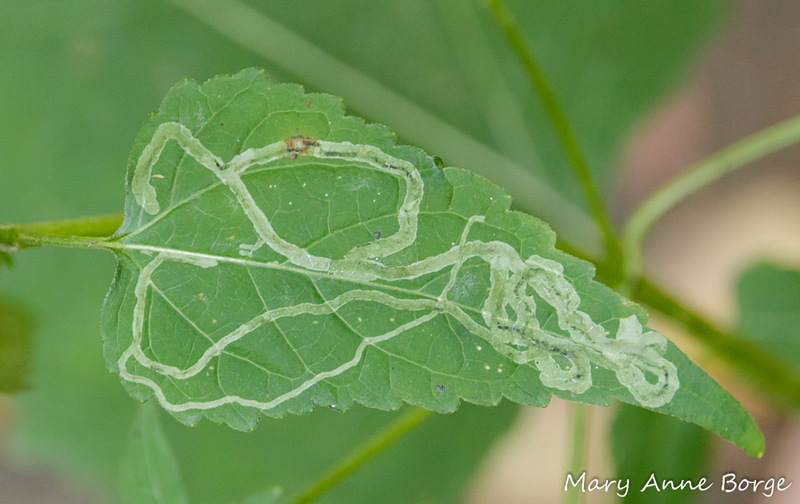 The larvae of Liriomyza eupatoriella develop between the outer layers of the leaf, feeding on the tissues inside. Mammals have plenty of other food alternatives (at least for now) without having to evolve a tolerance for White Snakeroot’s toxins. But tiny insects may gain an advantage if they can specialize on food that few others can consume (and live to tell the tale! ), especially a relatively common food source like White Snakeroot. 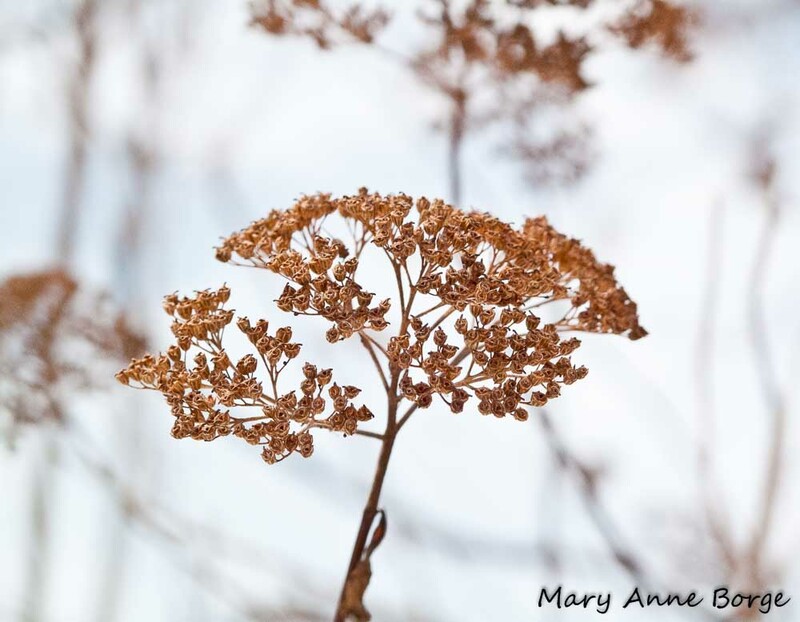 Despite its toxicity, several Native American tribes found medicinal uses for White Snakeroot, often using the root, but other plant parts as well. 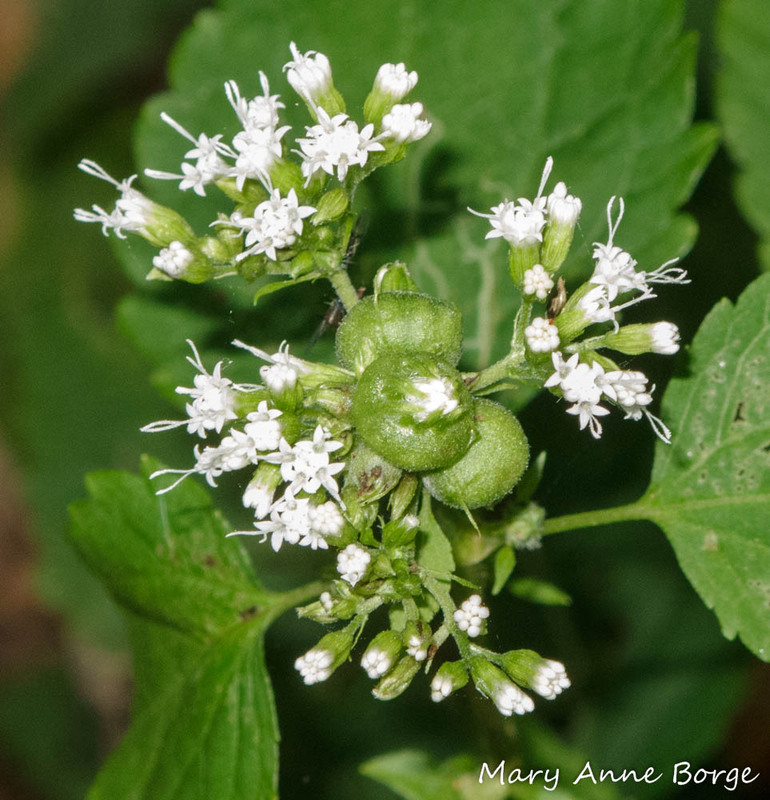 Some sources say that a poultice to treat snakebites was made from the root, resulting in the common name, White Snakeroot. 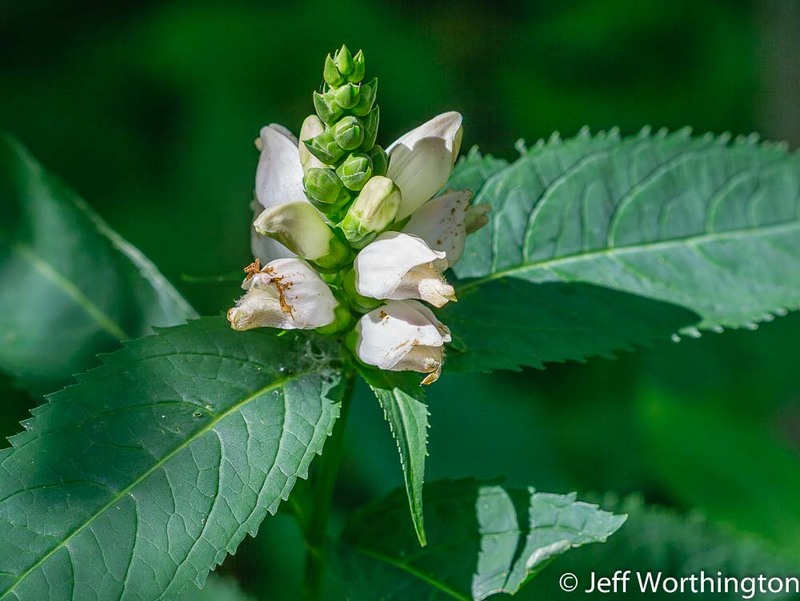 White Snakeroot is a plant of woods and woods edges. 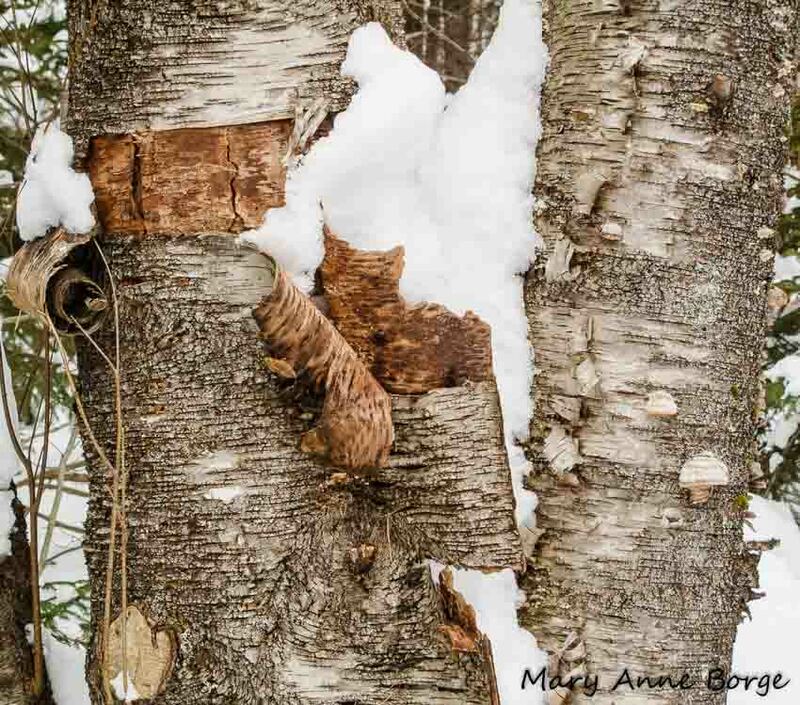 It prefers light shade but can tolerate partial sun, with moist to slightly dry soils. 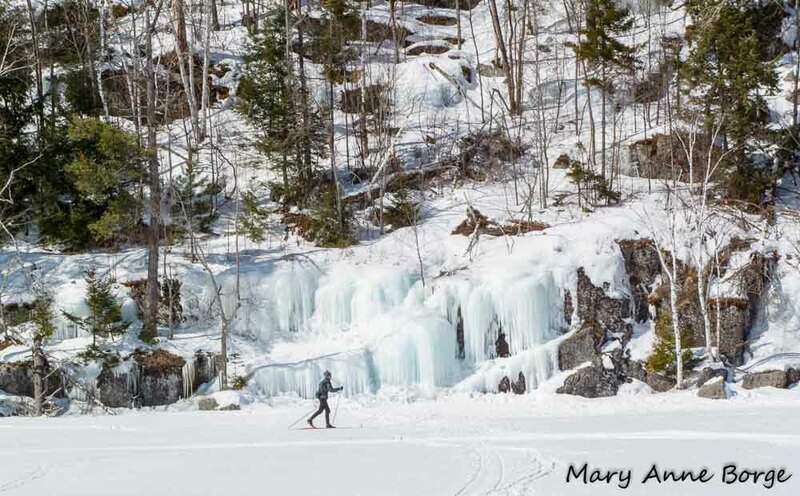 In Canada it is native in Ontario and Quebec provinces and the Northwest Territories, and in the United States from Maine to eastern North Dakota, south to Texas and the Florida panhandle, although it is much less widespread in the southeastern U.S.
Coffey, Timothy. 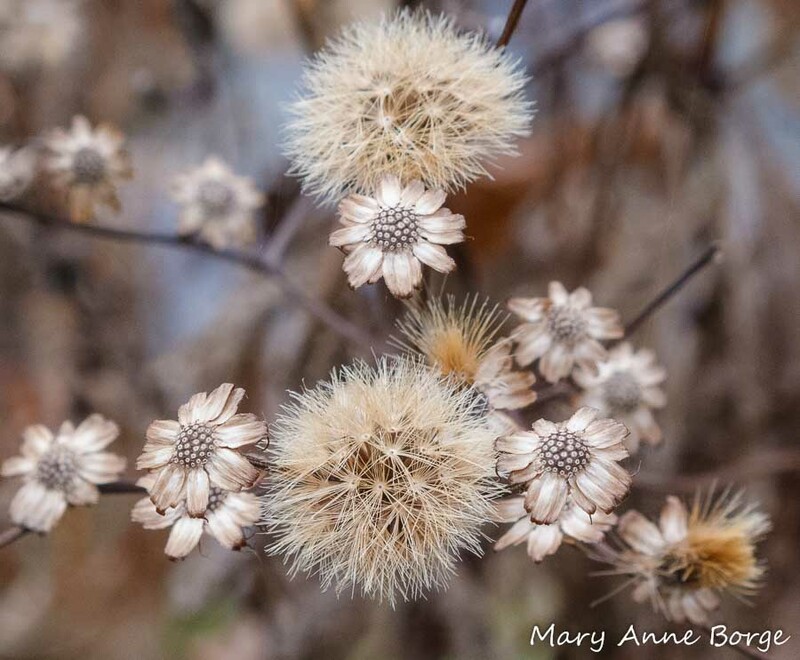 The History and Folklore of North American Wildflowers. 1993. Wheeler, A. G. Jr.; Miller, Gary L. Harmostes Fraterculus (HEMIPTERA: RHOPALIDAE): Field History, Laboratory Rearing, and Descriptions of Immature Stages. 1983. Wheeler, A. G. Jr. Harmostes reflexulus (Say) (Hemiptera: Rhopalidae): New Western U.S. 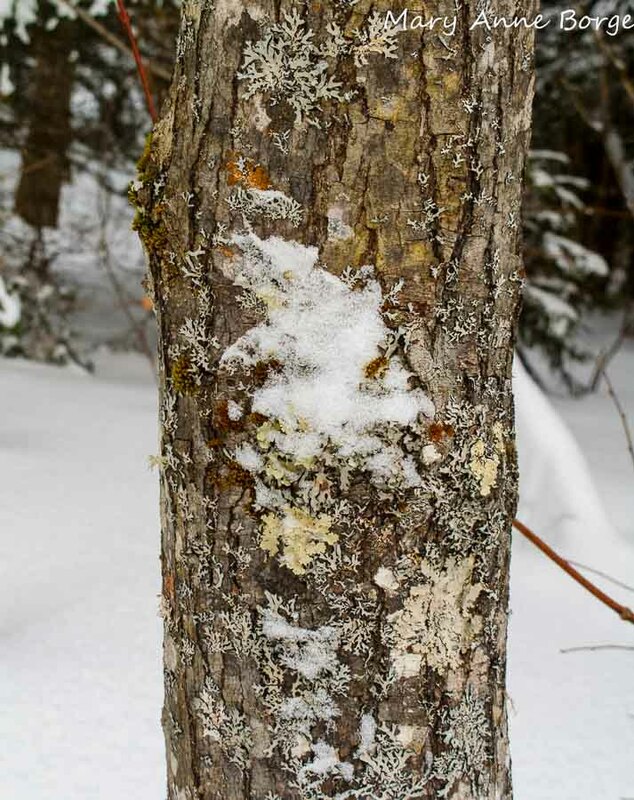 Host Records, Analysis of Host-Plant Range, and Notes on Seasonality. 2013. 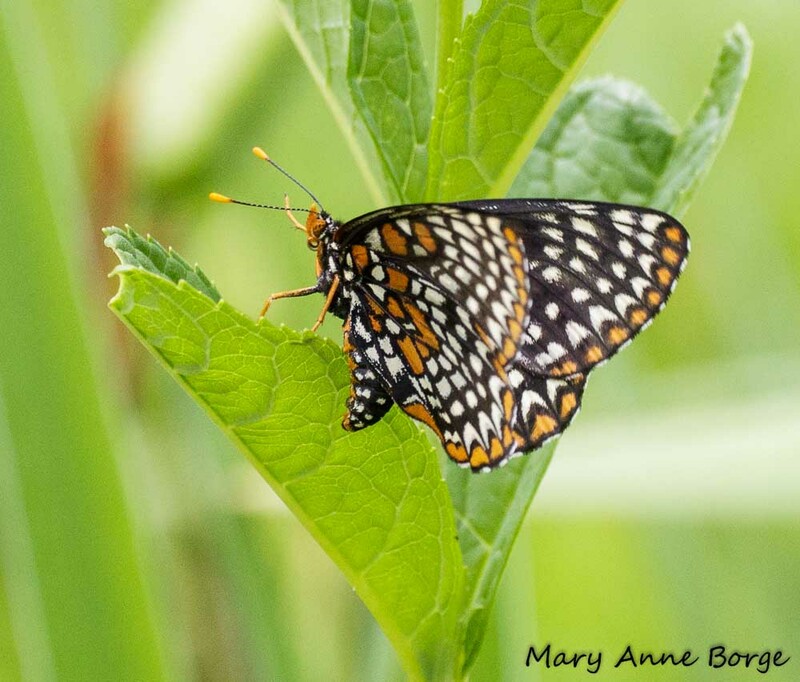 Why participate in a butterfly count? 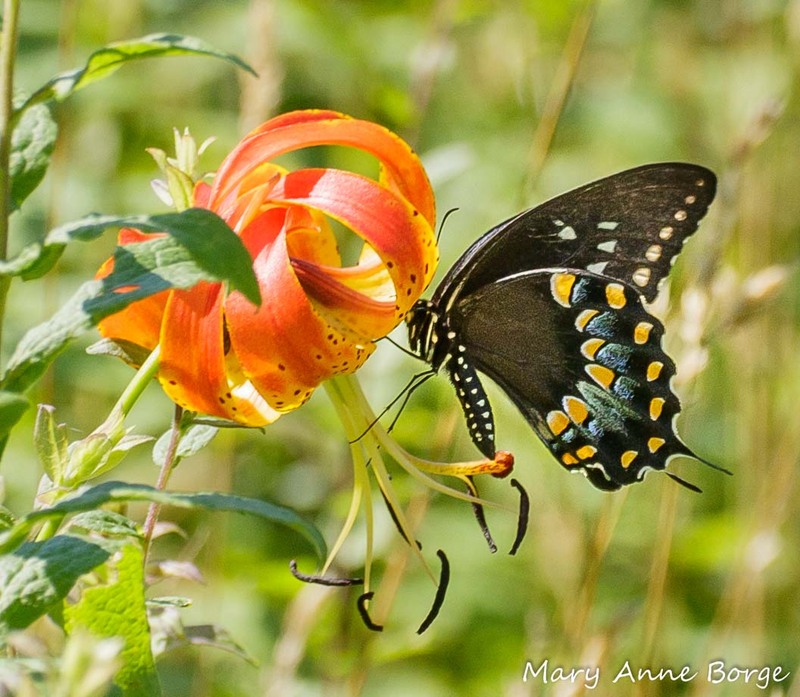 Well for one thing, you’ll be contributing to a citizen science project that gathers data to help assess how well butterfly species are doing over time. 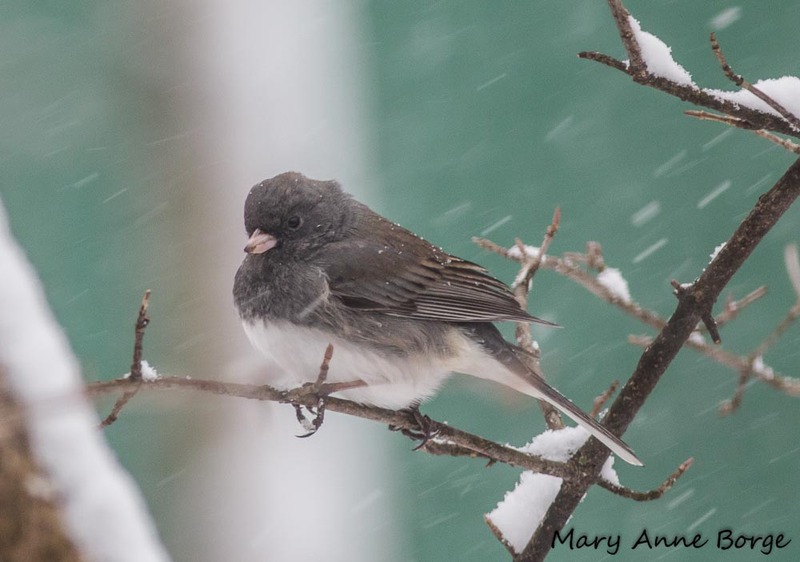 Are numbers for each species in a given area declining, increasing, staying the same? Are new species appearing in a location, are any disappearing? 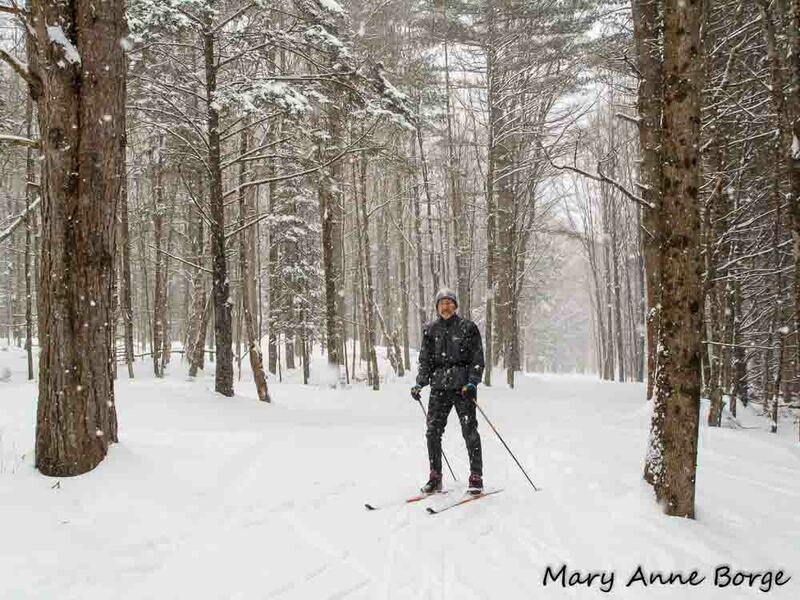 Citizen science is my excuse, but it’s not my reason. I do it because it’s fun. In mid-July, I participated in a count at Silver Lake Nature Center in Bristol, Pennsylvania. There were six of us. We started looking for butterflies even before we entered the natural areas, searching carefully while walking across a lawn. 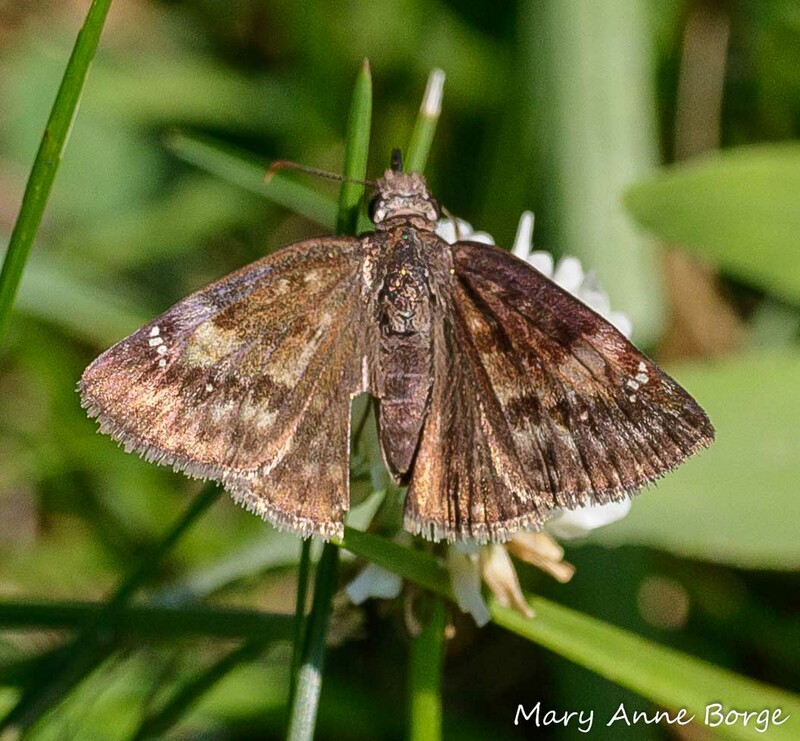 We were rewarded with sightings of Sachem, Peck’s Skippers, Eastern-tailed Blues, Common Buckeyes, Wild-Indigo Duskywings and Horace’s Duskywings. 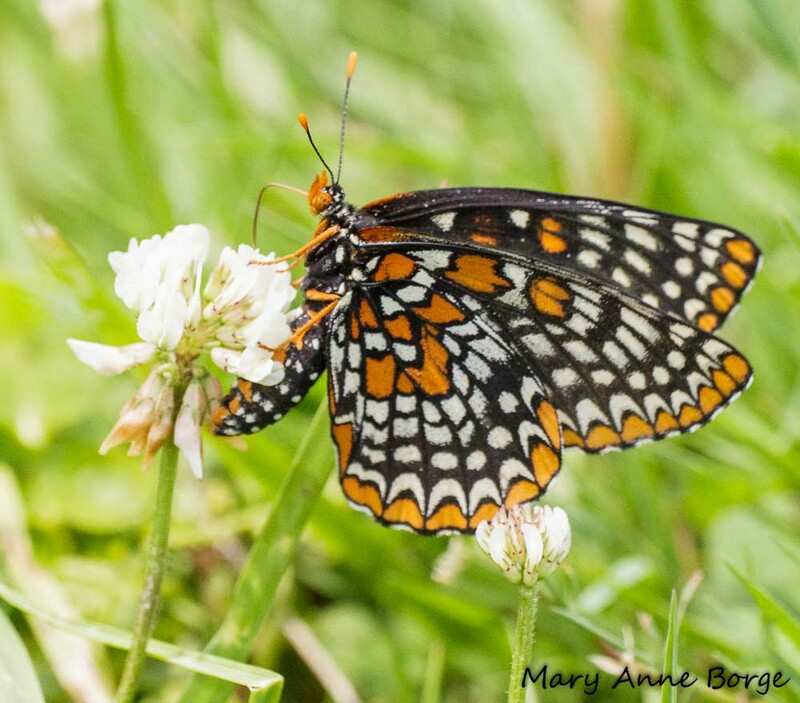 Are you wondering what attracted butterflies to the lawn, and why we even thought to look for them there? It’s not every lawn that would be so productive. 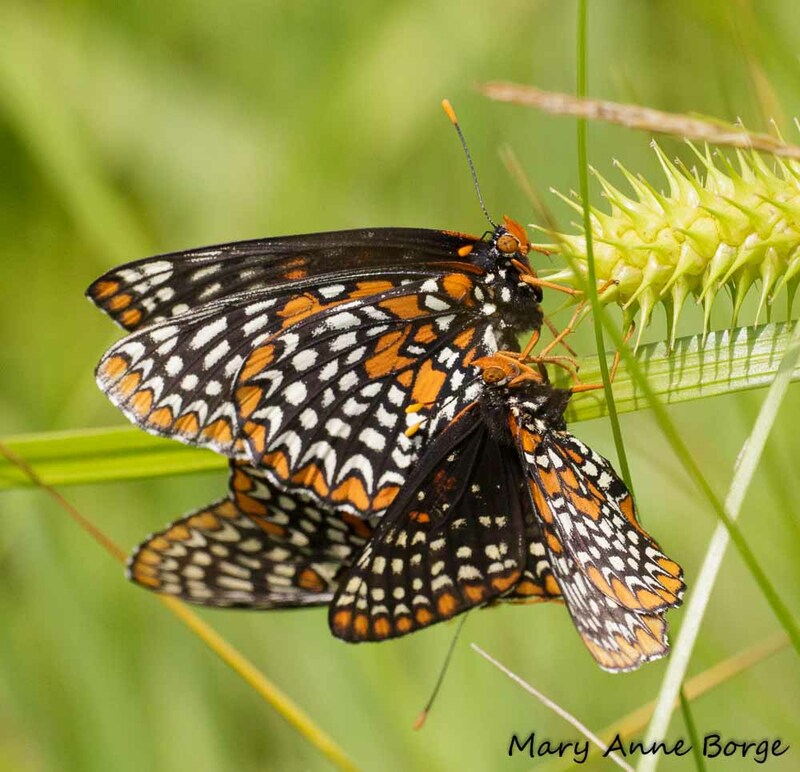 We were able to find butterflies in this lawn because it isn’t treated with pesticides or herbicides. 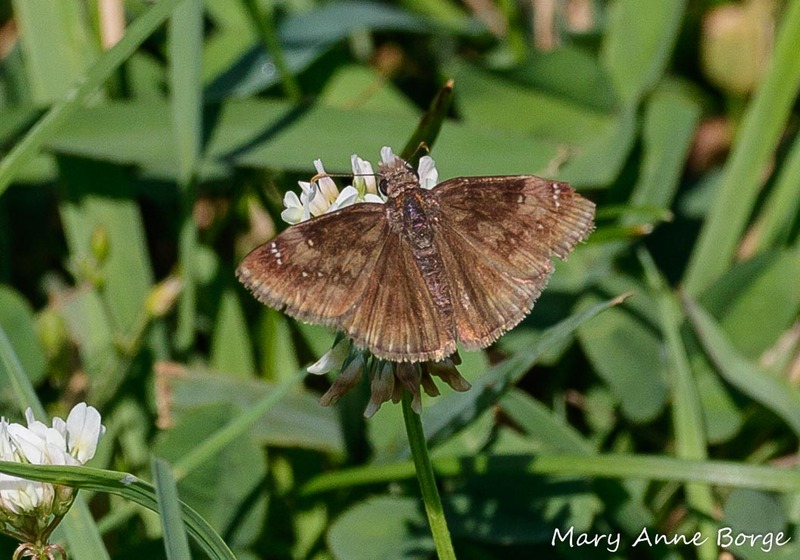 Most of the butterflies we saw were basking on blades of grass or drinking nectar from White Clover (Trifolium repens), a Pea (Fabaceae) family member. 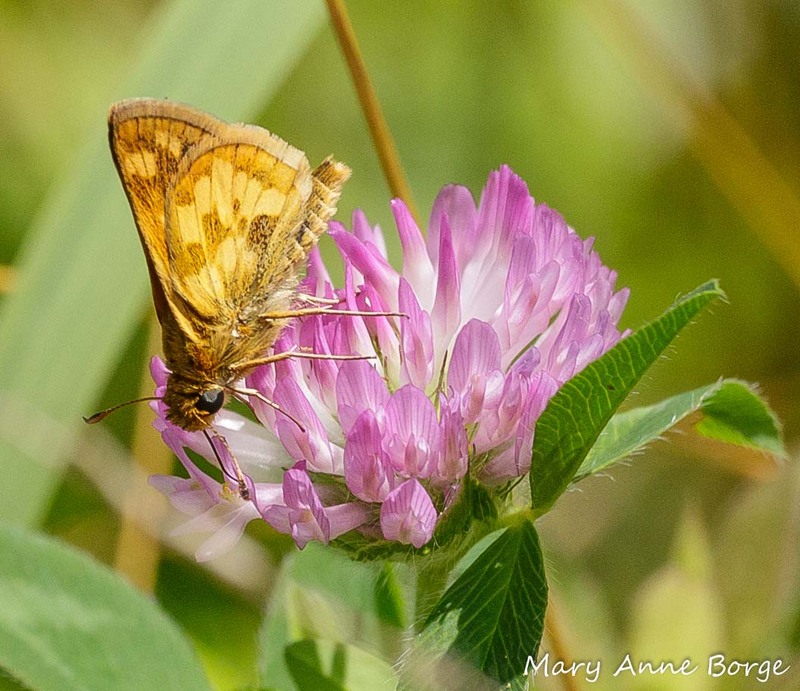 If herbicides were used, the clover wouldn’t be there to feed butterflies, bees and other pollinators. 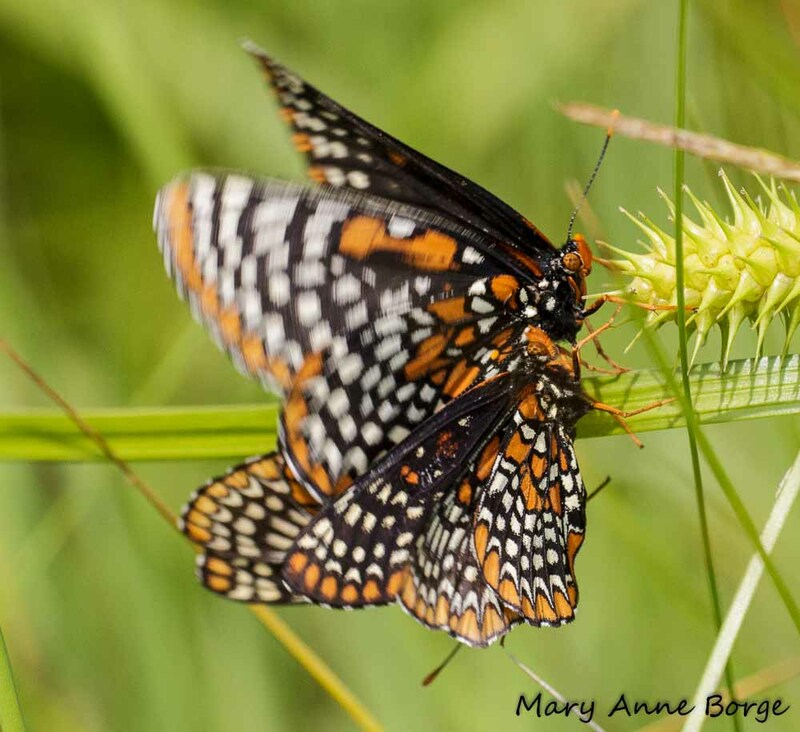 No crab grass would be available for Sachem and some other butterfly species to use as food for their caterpillars. Pesticides would kill the butterflies directly. Another bonus from having White Clover in the lawn is that it acts as a natural fertilizer, releasing nitrogen into the soil in a manner and quantity that can be used effectively by the other plants living there. It actually helps the grass to be healthier. Even better, there is no excess chemical fertilizer to run off into streams, rivers and other waterways. Years ago, white clover was included in grass seed mixes for this very purpose, until fashions changed, calling for a monoculture lawn with no clover, dandelions or violets. Maintaining this uniform green carpet requires regular applications of herbicides to kill everything but grass, and synthetic fertilizer, to keep the grass growing. The result is an expensive and toxic lawn maintenance regimen, devoid of butterflies, but welcoming to Japanese Beetles. As the fashion trend turns back, lawns become a safer, less toxic place to play for pets, children and even adults. We worked our way across the lawn to the powerline cut through Delhass Woods. 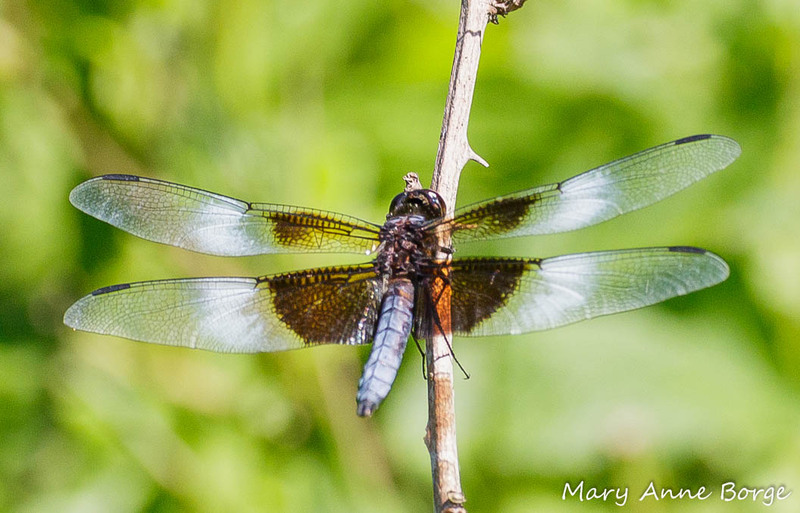 A male Widow Skimmer dragonfly stood guard in the grasses as we approached the entrance. 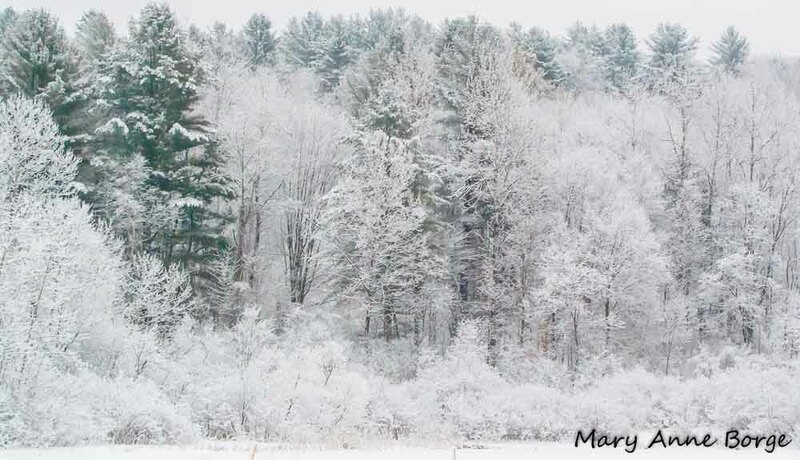 This is a much ricer habitat for butterflies, a sunny area filled with diverse plants that provide food for butterflies in the form of nectar, and food for their caterpillars in the form of the leaves of plants on which they specialize. 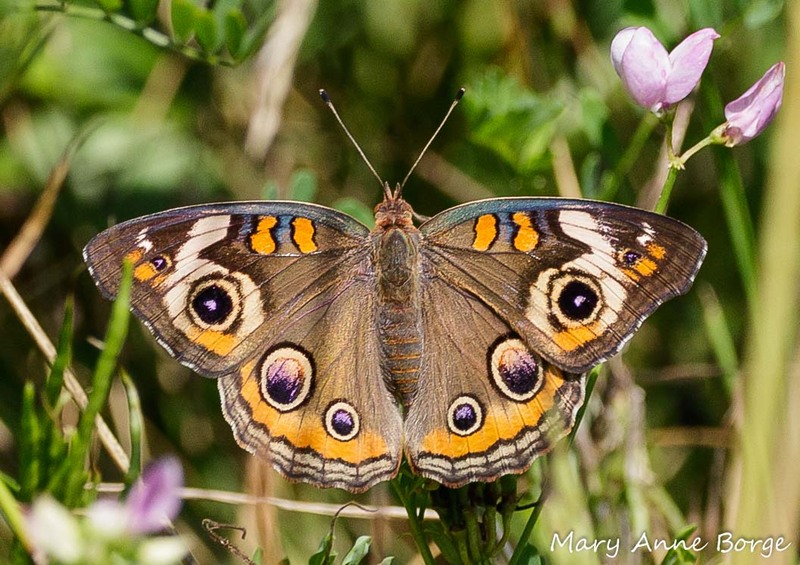 Plants in the Pea family, including Red Clover (Trifolium pretense), Crown Vetch (Securigera varia), and Wild indigo (Baptisia tinctoria), were a big draw for butterflies. 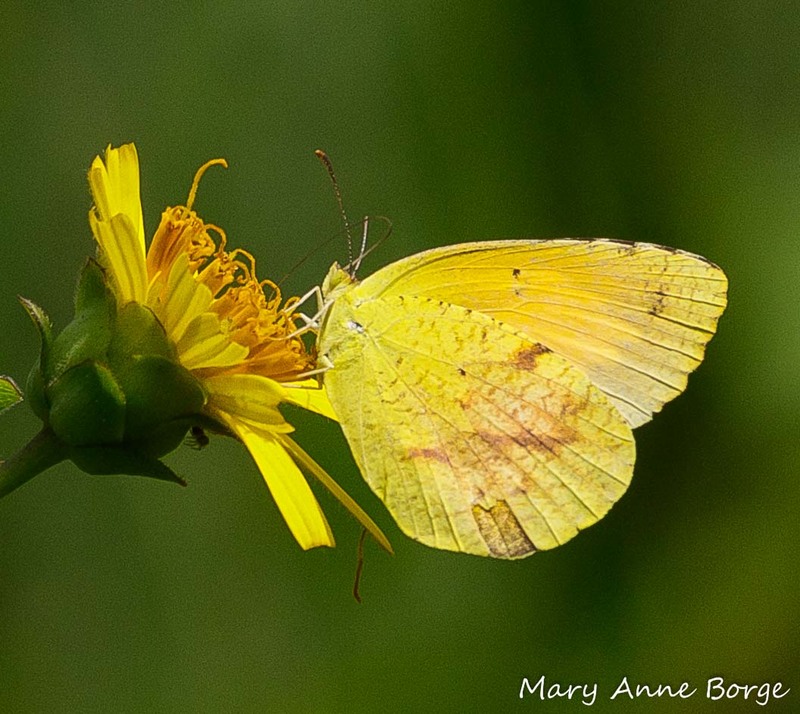 Not only do the flowers offer nectar, but Wild Indigo Duskywings, Wood Nymphs, Clouded Sulphurs, Orange Sulphurs and other butterflies use these plants as food for their caterpillars. 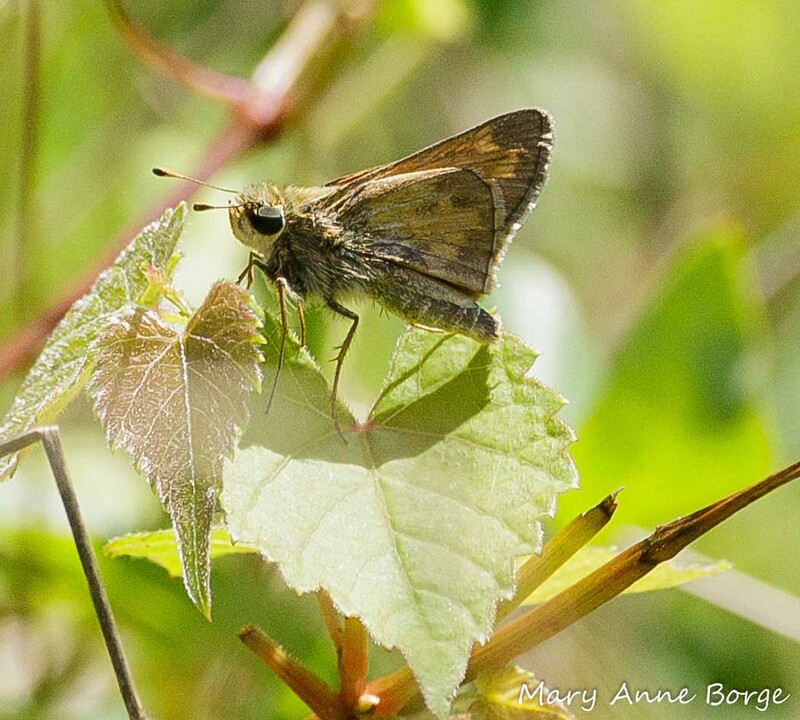 All of these species were present in good numbers, along with Common Buckeyes, Peck’s Skippers, and Sachem. We saw Wood Nymphs and Spicebush Swallowtails, but they didn’t pose for me this year. Last year they were pre-occupied enough with other activities to be more cooperative. 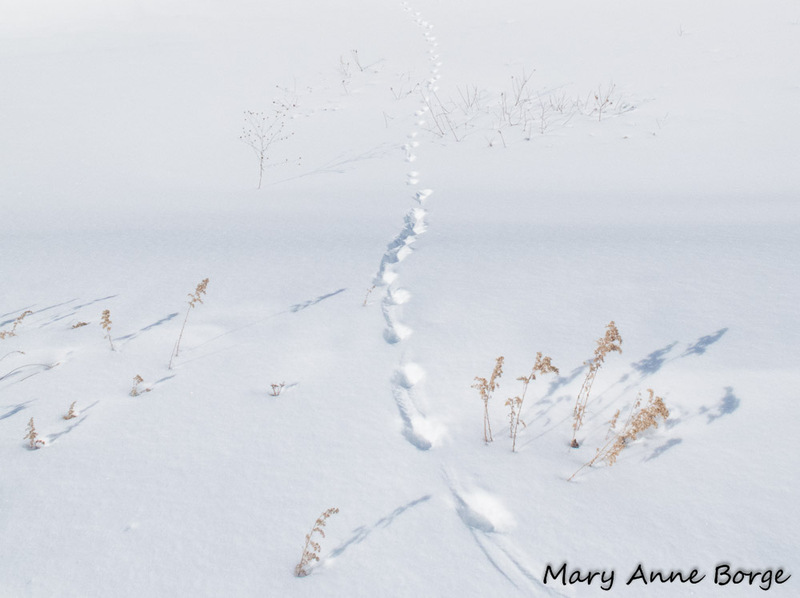 Surrounded by such a varied and rich habitat, an open area with woods on either side and a pond nearby, we couldn’t help but occasionally be distracted by birds and other critters, and some plants I don’t often see. 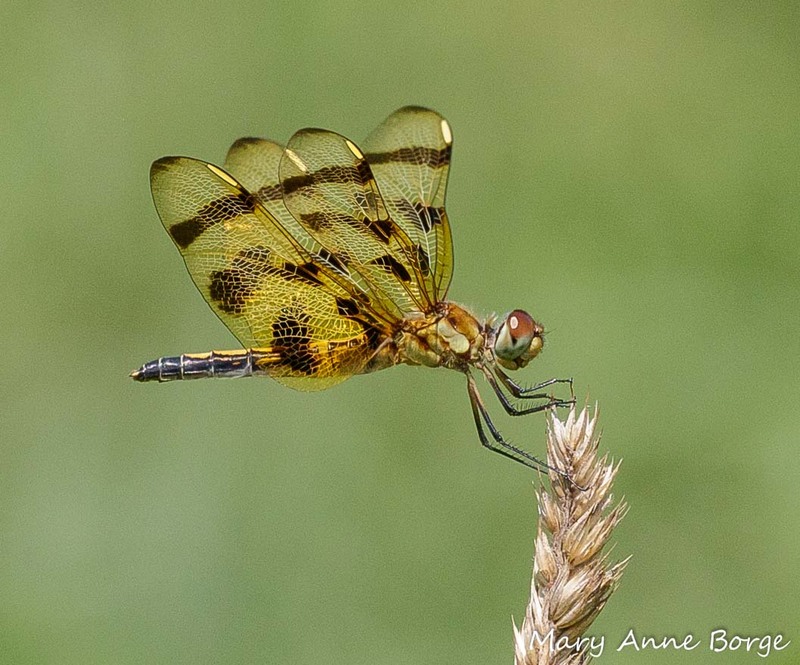 A Halloween Pennant dragonfly monitored our progress as we finished up our search of the powerline cut. After a break, we moved on to the woods, marshes, and gardens. Cabbage Whites were everywhere. 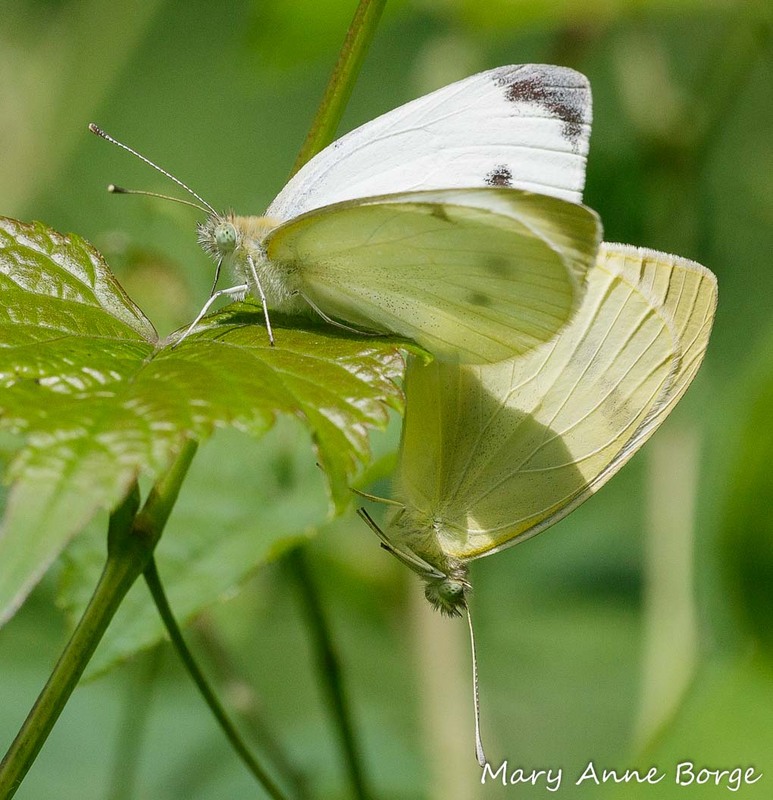 Cabbage Whites aren’t native to North America, and can be a problem for farmers. 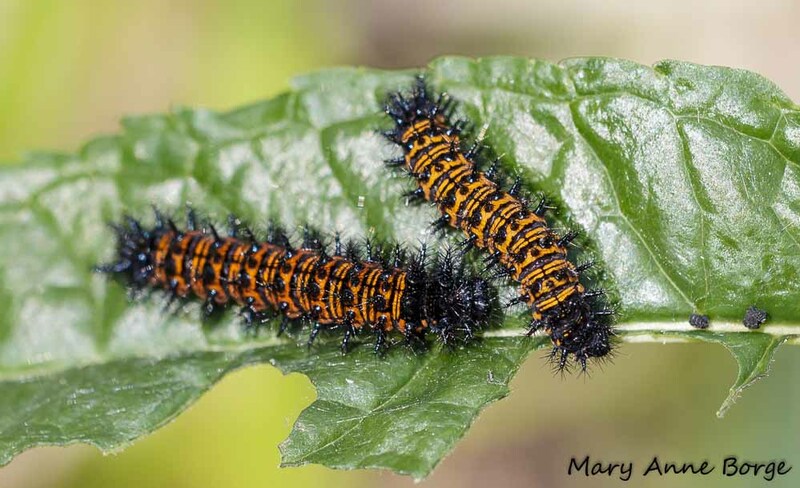 Their caterpillars feed on some plants in the mustard or cabbage (Brassicaceae) family. If you have ever found a small green caterpillar in your broccoli or kale (I have), it was probably a Cabbage White. 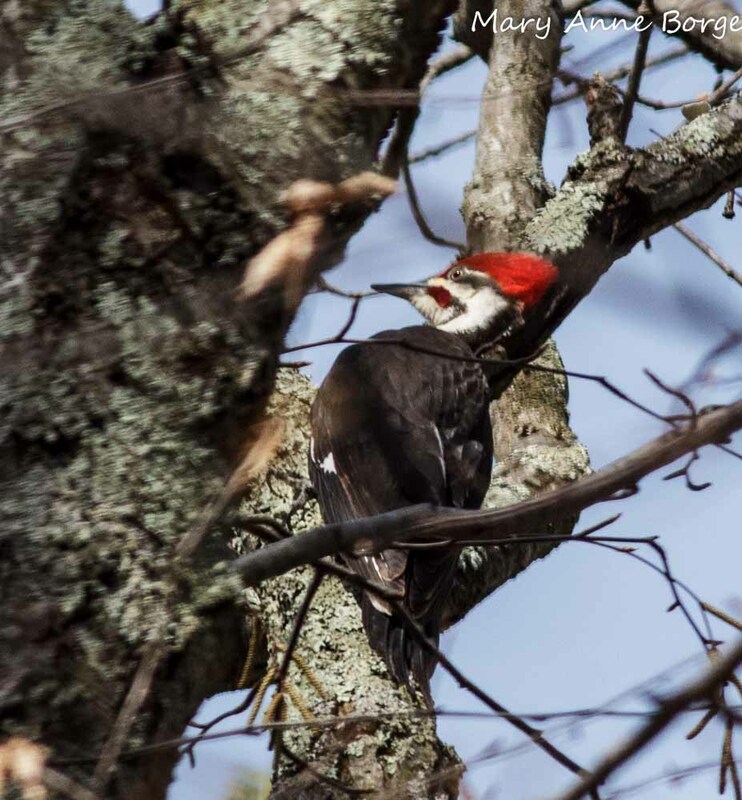 They have done so well in North America that they are often the species with the highest numbers for a count, as they were this day. 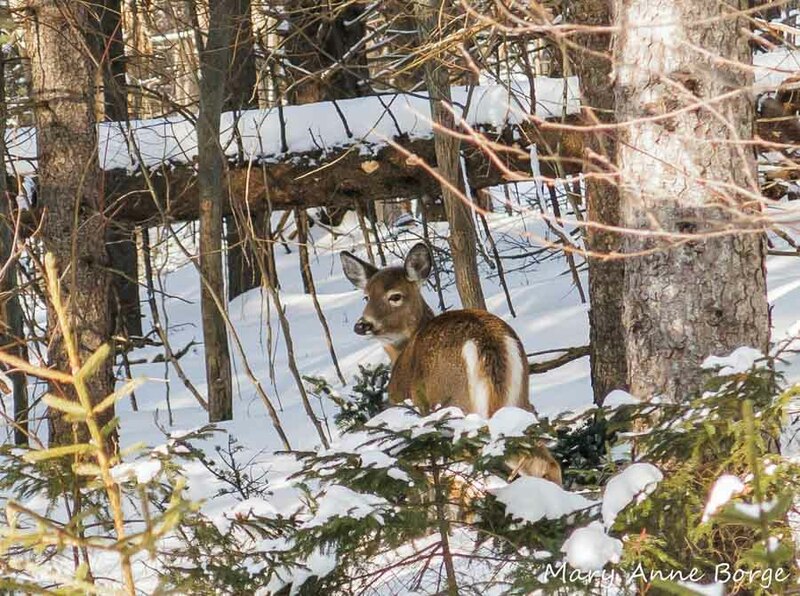 They ignored us while they mated in the woods. 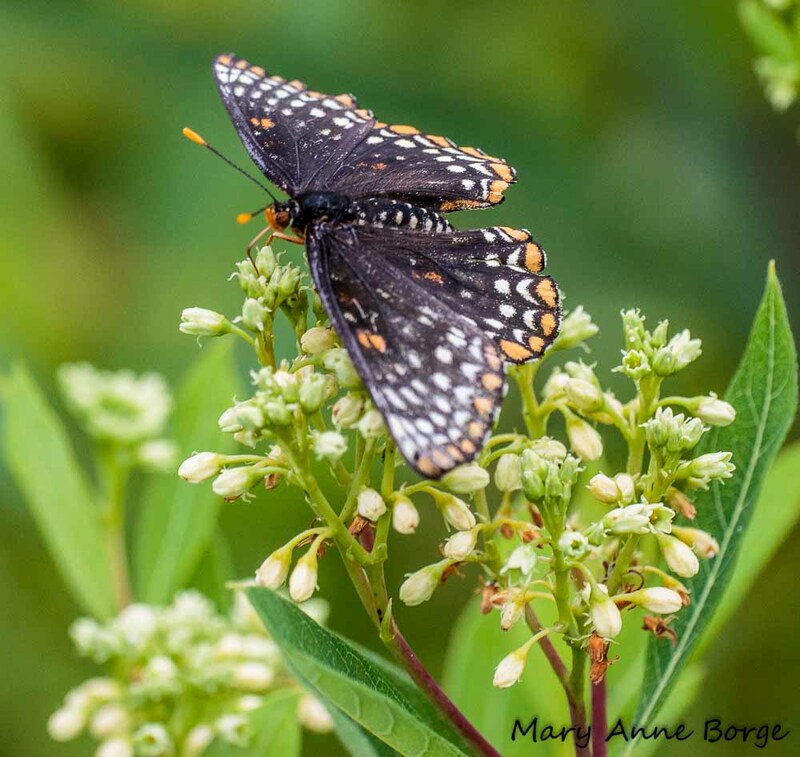 Eastern Tiger Swallowtails, Silver-spotter Skippers, Red Admirals and Sachem all enjoyed the nectar Buttonbush (Cephalanthus occidentalis) provided in the marshy areas. Sachem also enjoyed the garden. 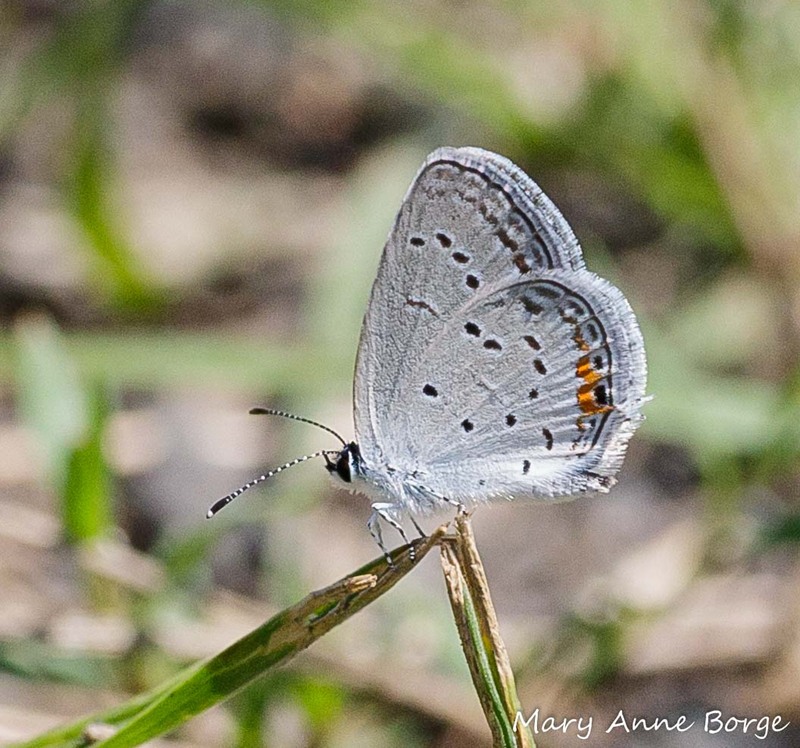 A week later I did another butterfly count at Bowman’s Hill Wildflower Preserve near New Hope, Pennsylvania. 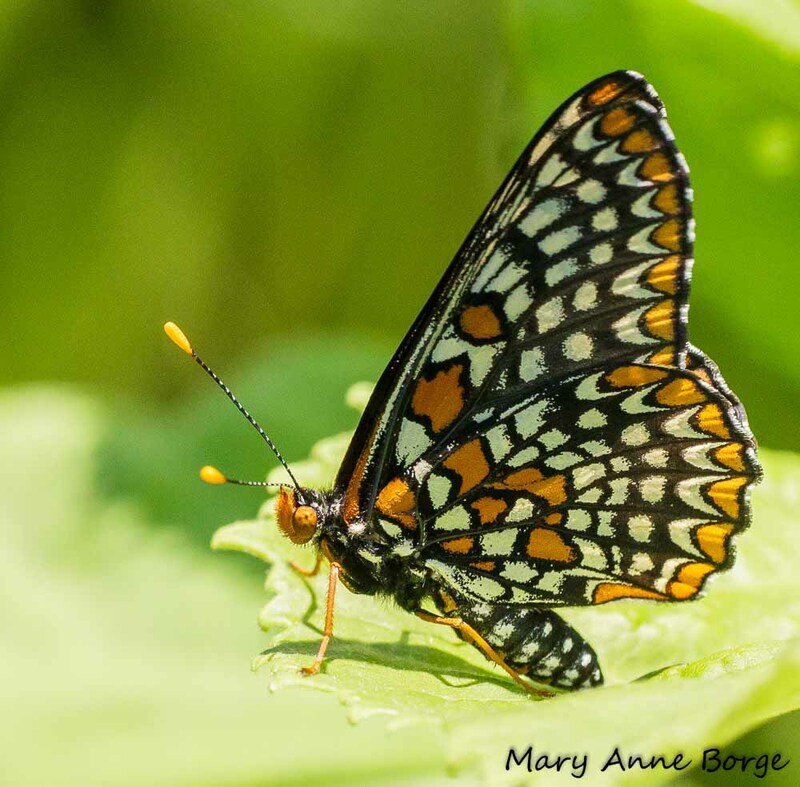 We had our best year since 2013, seeing twice as many butterflies as we did in 2014-2016. 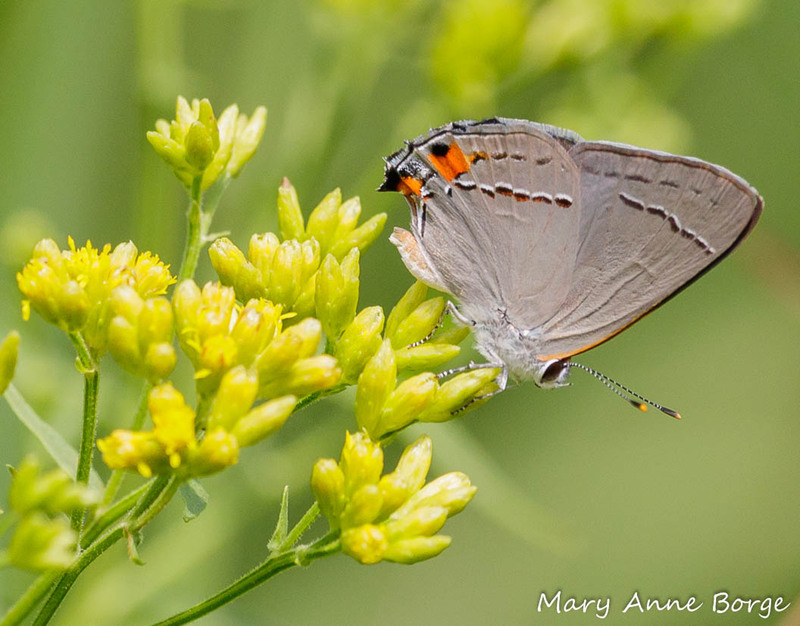 Some highlights were Juniper Hairstreaks, a small but beautiful butterfly that is considered ‘locally common’ because it is usually only found near its caterpillar food plant, Eastern Red Cedar (Juniperus virginiana). 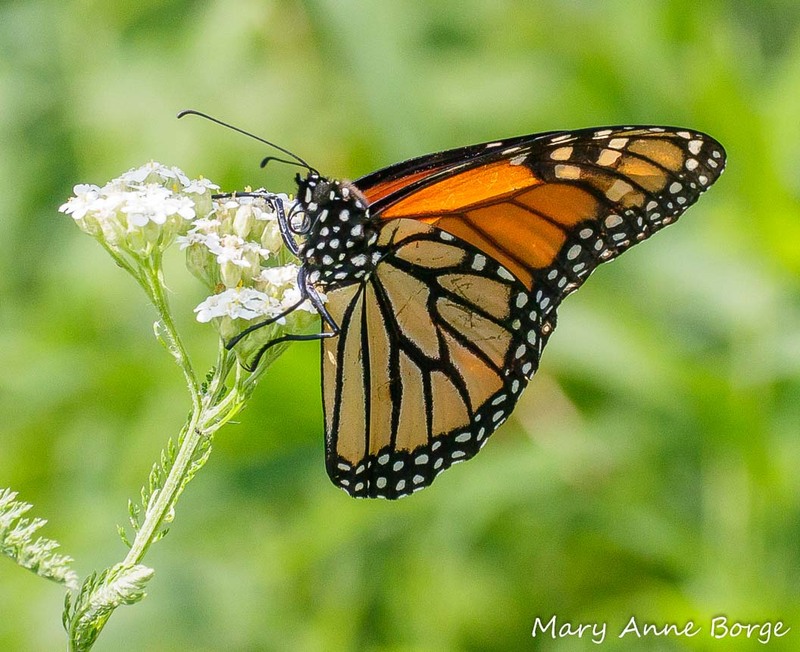 We saw our highest number of Monarchs in the 6 years we have participated in the count. 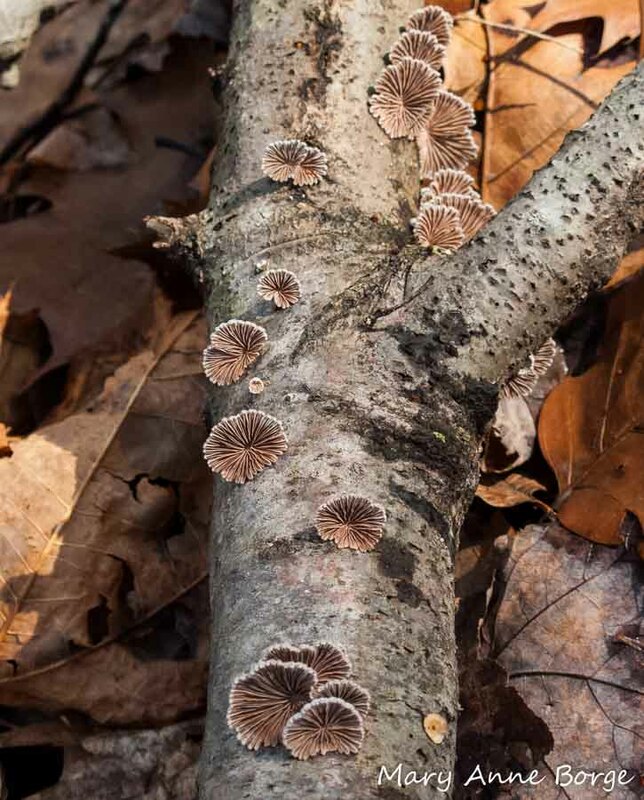 It was really exciting for me to see so many Sleepy Oranges, a southern species that returned to this Pennsylvania location after a nearly four-year absence. So why do a butterfly count? 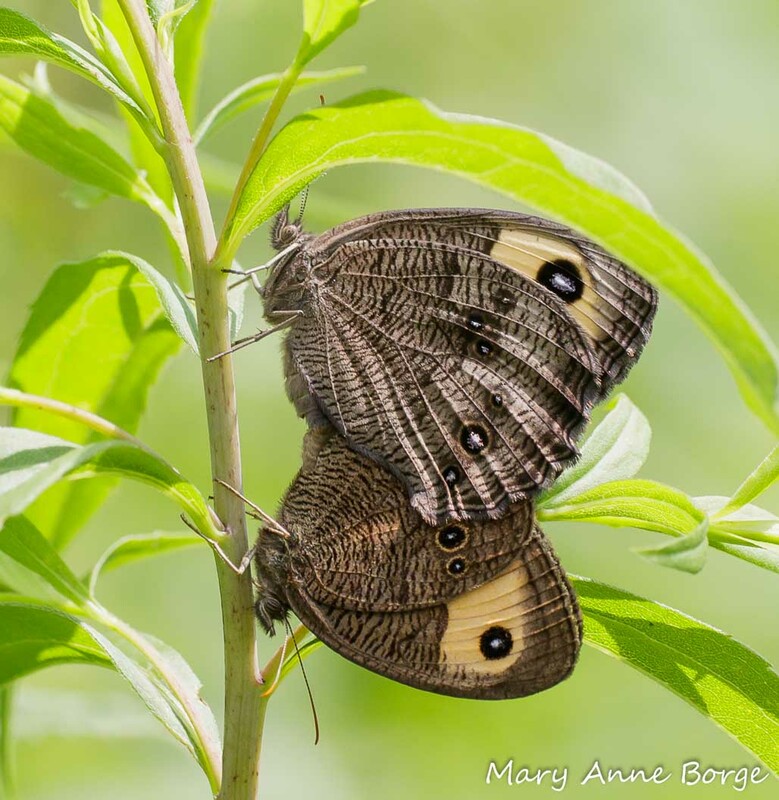 You’ll get to see beautiful butterflies and other critters interacting with gorgeous plants, and you’ll share the day with people who are enjoying themselves as much as you are, all while contributing to a citizen science effort that monitors the health of butterflies. And you’ll have fun. 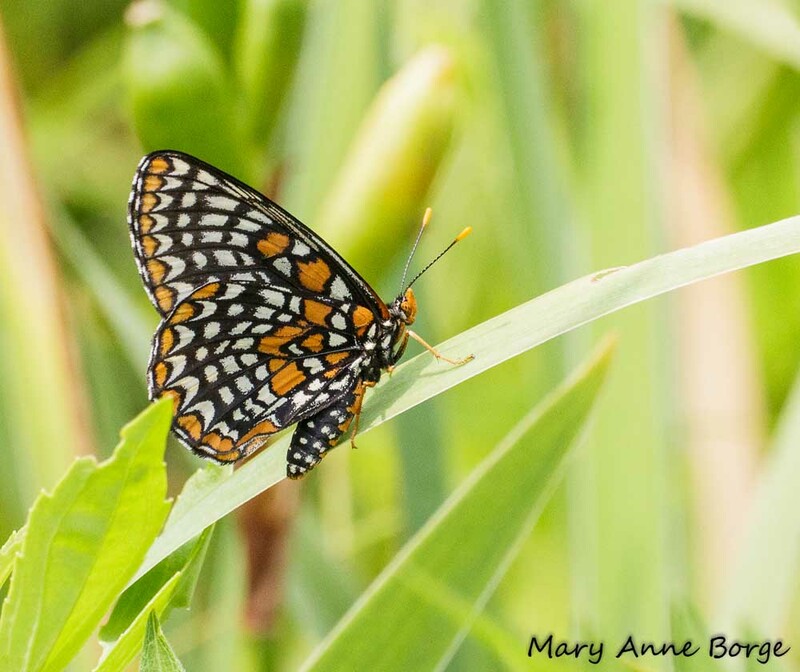 To find a butterfly count near you, check with the North American Butterfly Association. 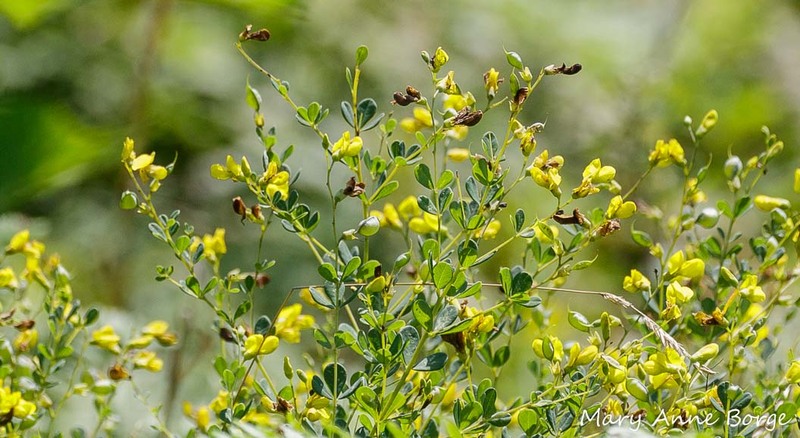 What Do Juniper Hairstreaks and Cedar Waxwings Have in Common? Warning! Before you read any further, I should warn you that some of the content of this post is for mature audiences only. 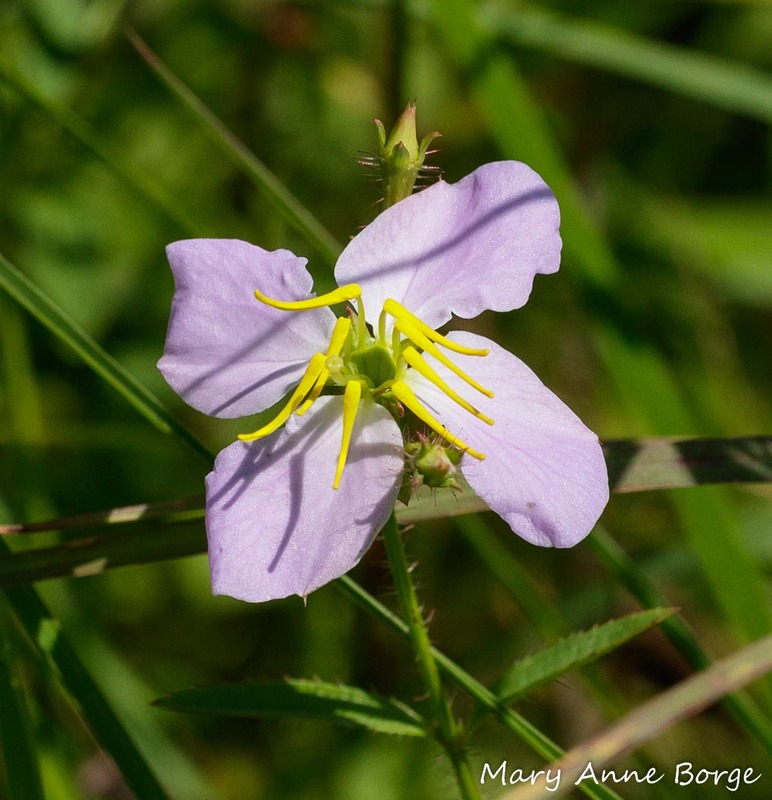 On May 18 I joined a group from the American Entomological Society to do an insect survey at Bowman’s Hill Wildflower Preserve. 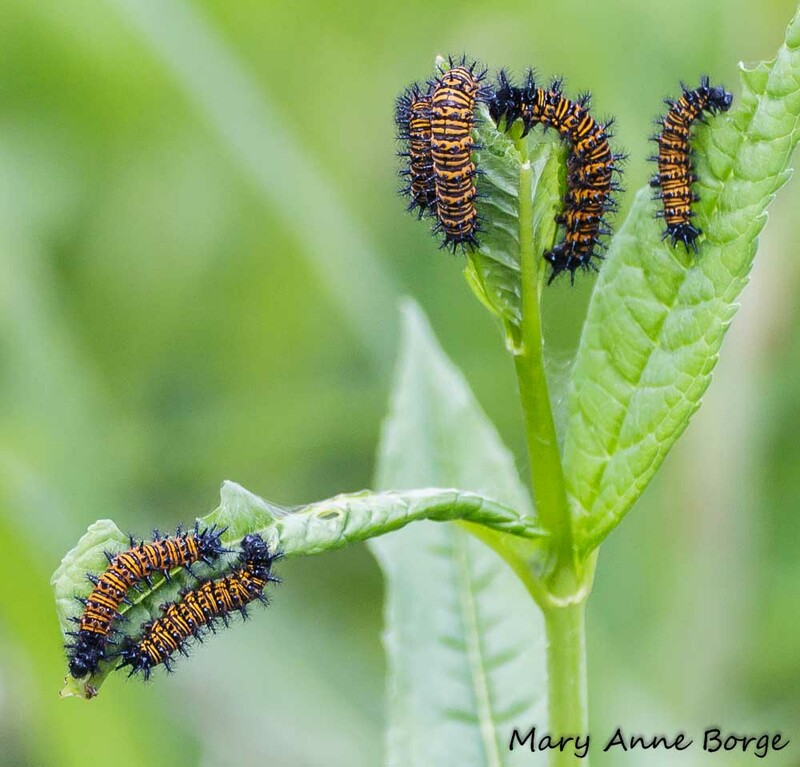 As we fanned out across the meadow, one of the participants found dozens of caterpillars feeding on plants in the wet part of the meadow. They turned out to be Baltimore Checkerspot (Euphydryas phaeton) caterpillars eating the leaves of Turtlehead (Chelone glabra). 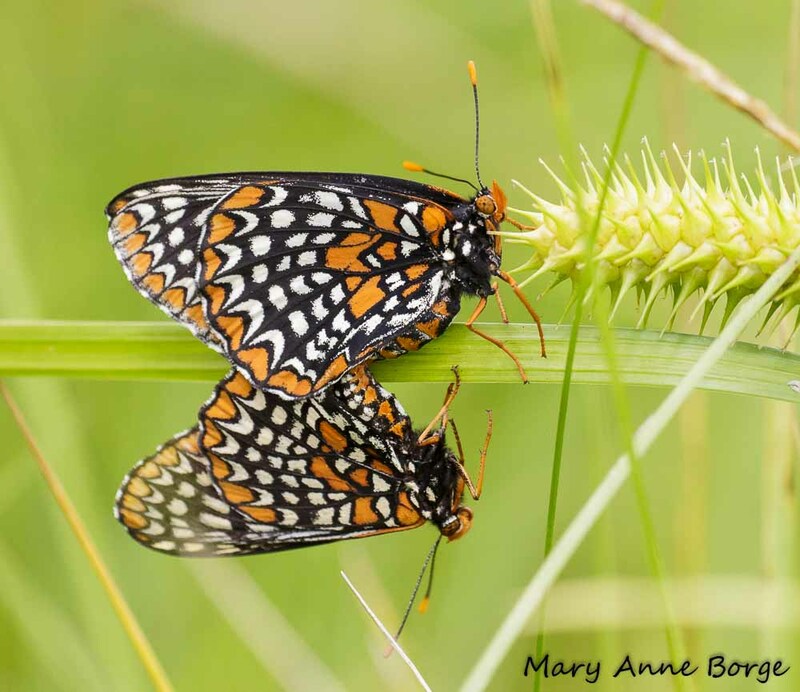 Baltimore Checkerspots are reported to use a few different species of plants as food for their caterpillars, particularly in their later growth stages. But their preferred food plant is Turtlehead. 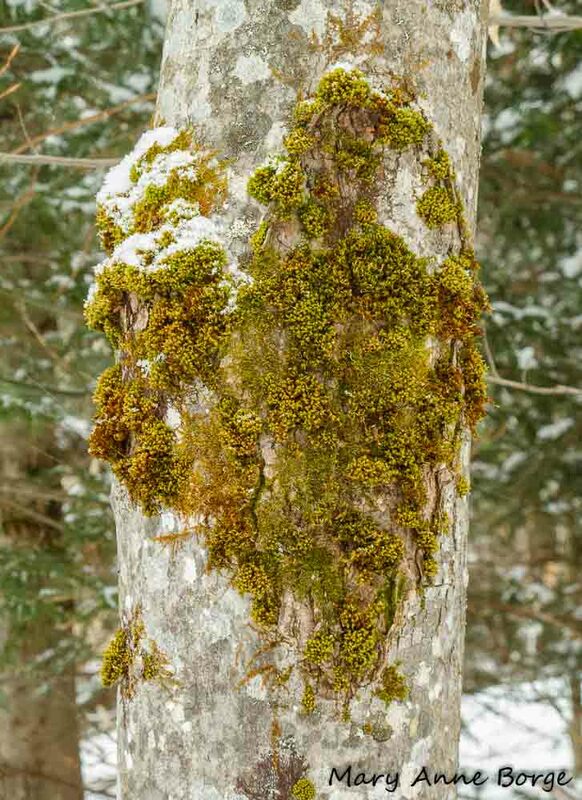 This plant contains iridoid glycoside chemicals which enhance the caterpillars’ growth and makes them distasteful to birds. 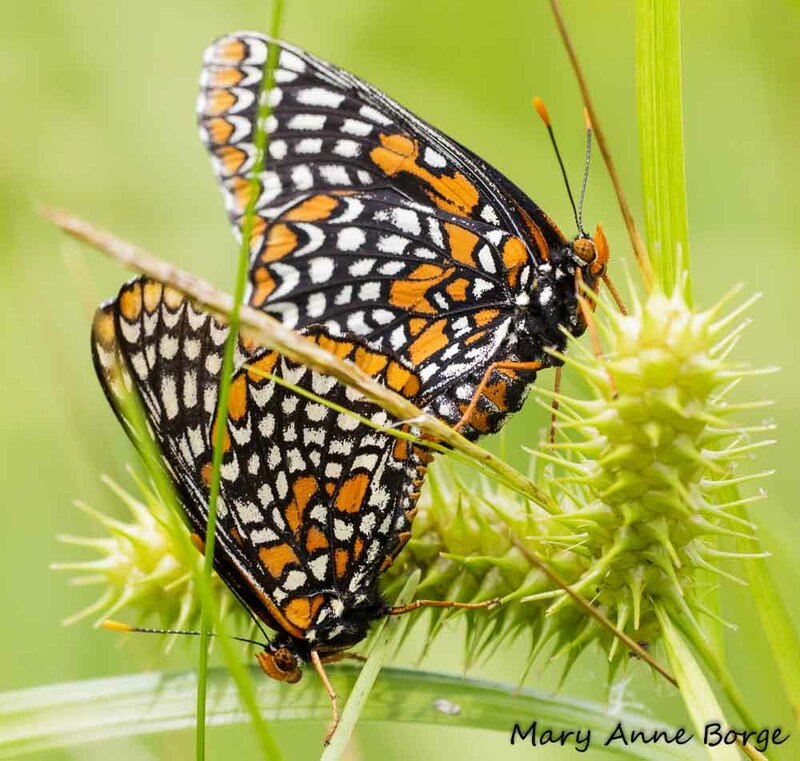 Both the caterpillars and the resulting adult butterflies benefit from this protection, and their bright black, white, and orange coloration act as a warning to advertise their toxicity to potential predators. It helps to fend off attempts to eat them. 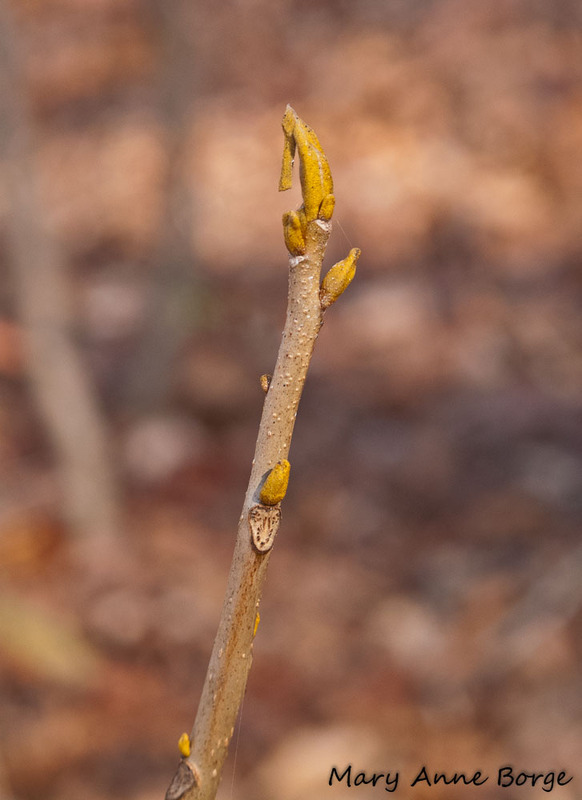 Given the early date, the caterpillars were almost certainly individuals that had spent the winter there in the meadow. 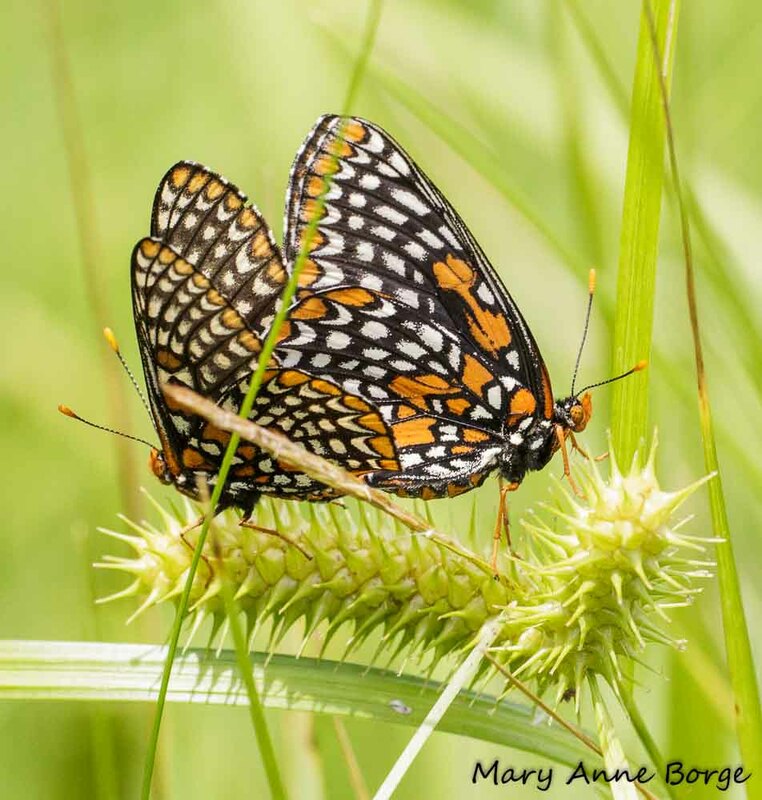 On June 16, almost a month after the initial caterpillar sighting, I saw two adult Baltimore Checkerspot butterflies for the first time, not far from where we saw the caterpillars. 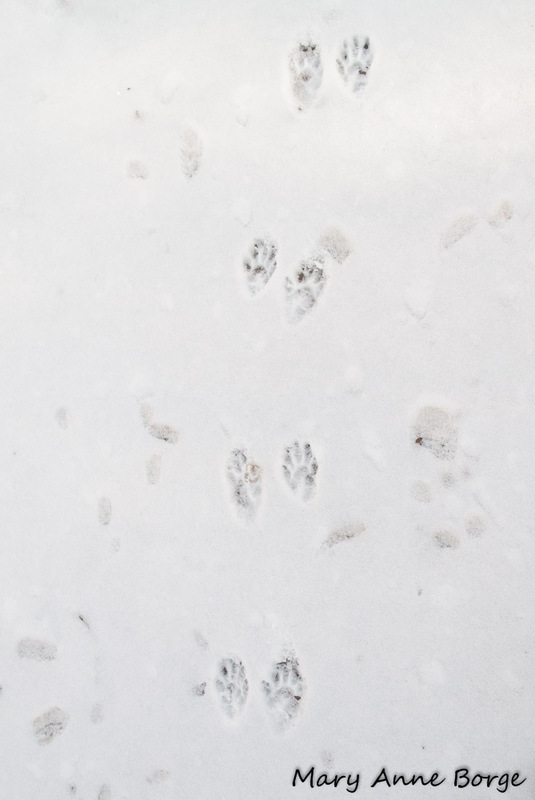 A week later, there were at least 10 individuals in the same general vicinity. 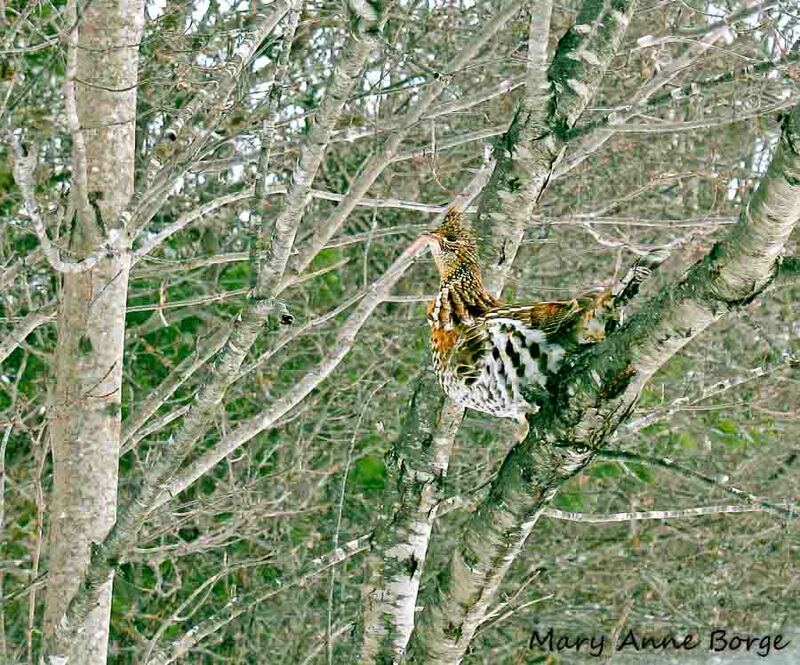 They spent most of their time perching fairly low to the ground, either basking or advertising for a potential mate. Most flights were short and fairly low. 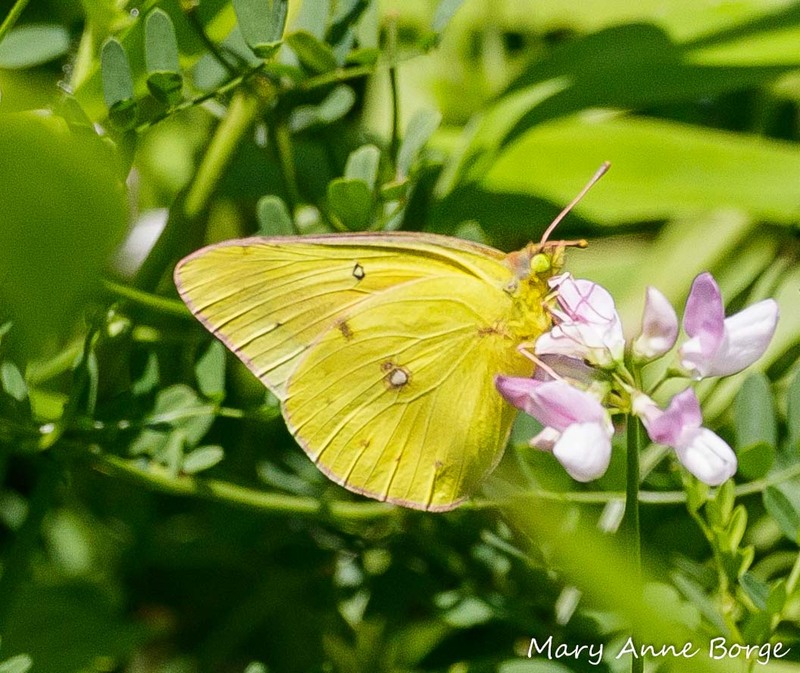 Occasionally I saw a butterfly drinking nectar from Indian Hemp (Apocynum cannabinum) or White Clover (Trifolium repens). Ok, this is where things start to get a little racy. Eventually I spotted a pair of butterflies deep in the meadow foliage, mating. 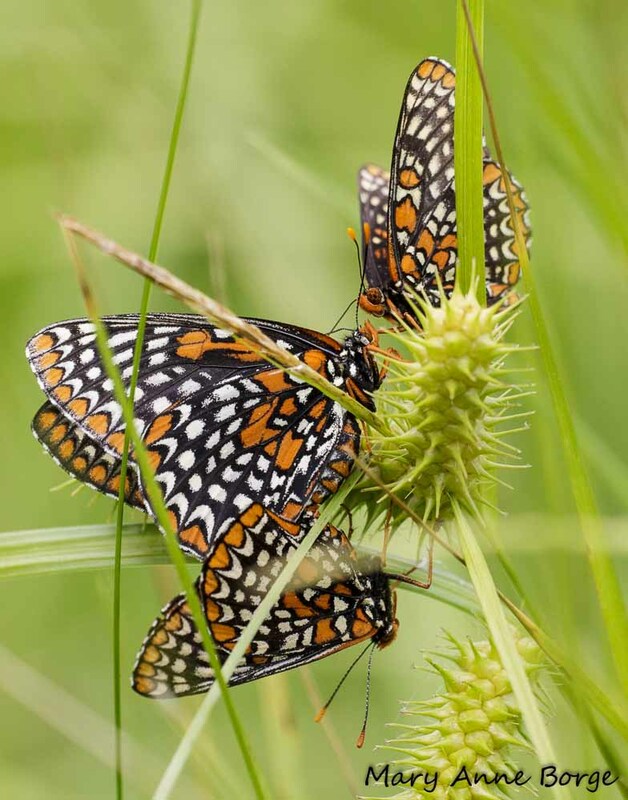 They gradually moved higher on the sedge to which they were clinging, changing positions, taking turns being on top. They were intent on their goal. 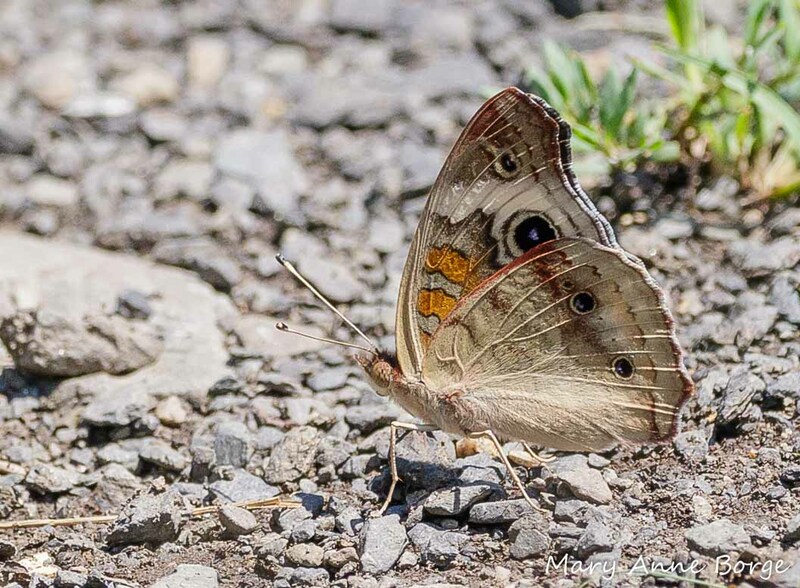 Several times another butterfly, I’m guessing a male, tried to break up the happy couple. They indicated their disinterest to him by flapping their wings. When he persisted, they steadfastly ignored the intruder. They were not the only couple that managed to meet up. I did spot another example of splendor in the grass a bit further along the trail. 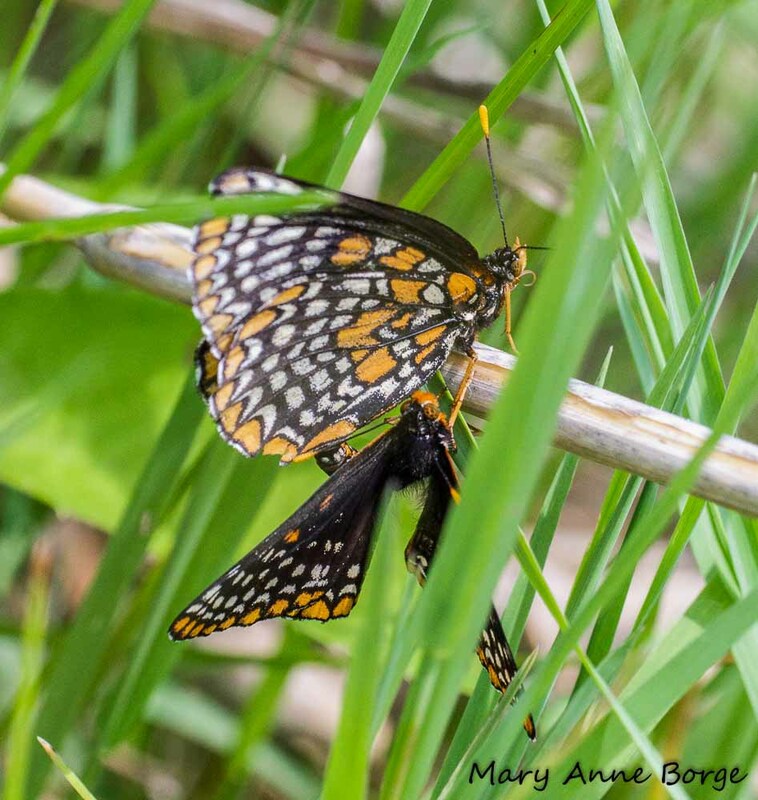 When I went back to check the Turtlehead where the initial caterpillar sighting took place, there were several females laying eggs (ovipositing). 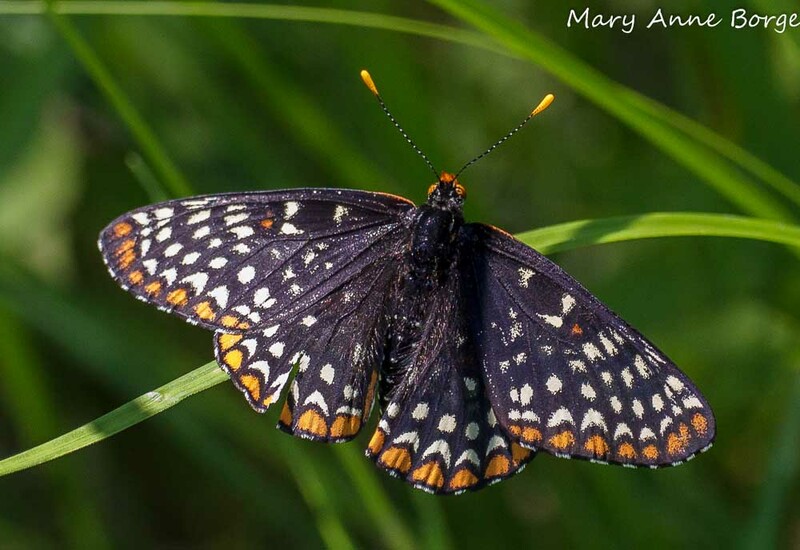 Looks like the Preserve will see another generation of Baltimore Checkerspots. 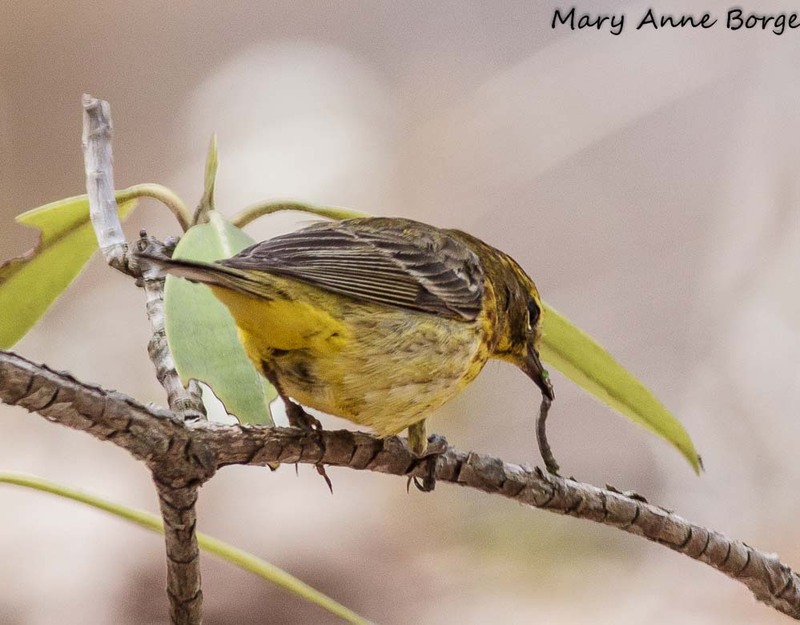 Warbler Migration is in Progress! 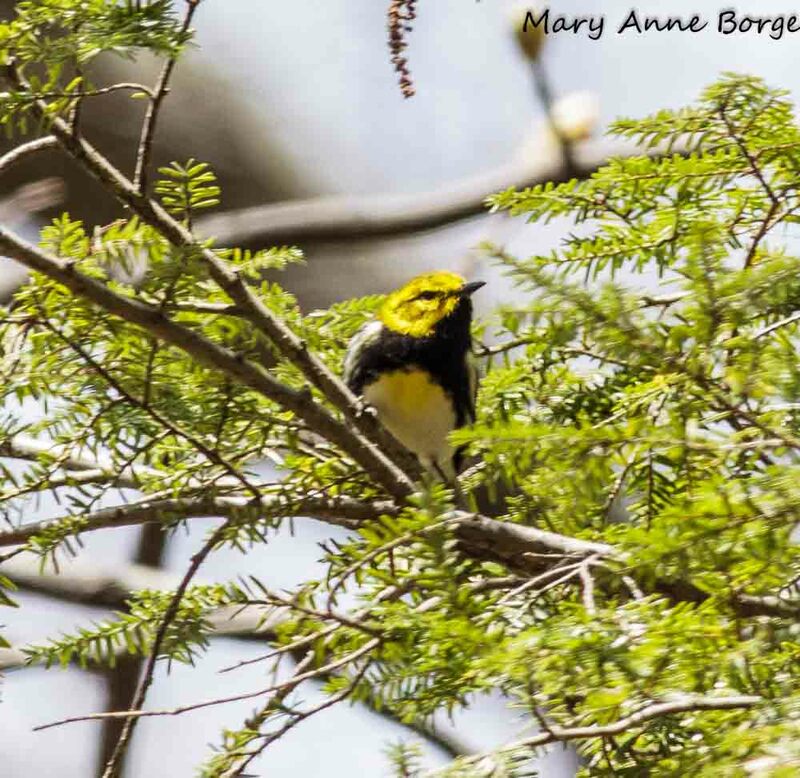 Monday was a beautiful spring day, perfect for birding at Bowman’s Hill Wildflower Preserve. 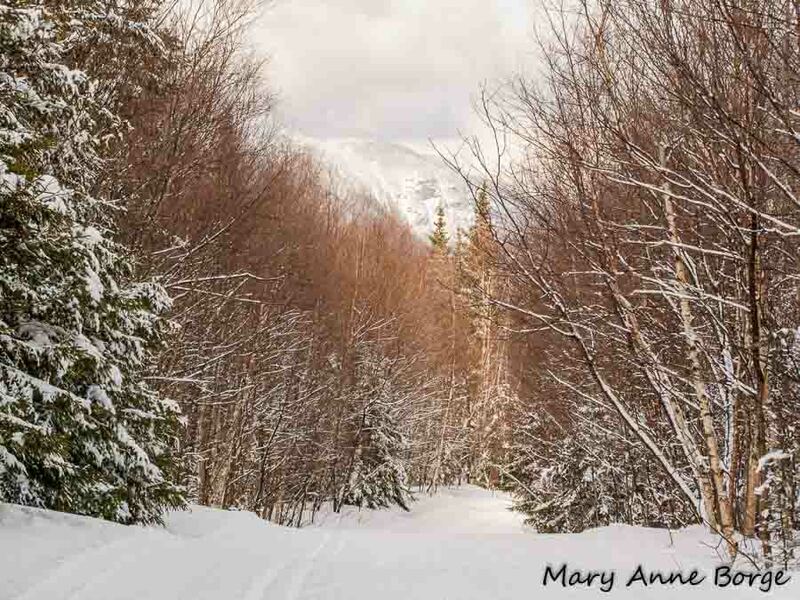 The weather was sunny but cool, and probably as a result, the birds weren’t active until a bit later than we expected. 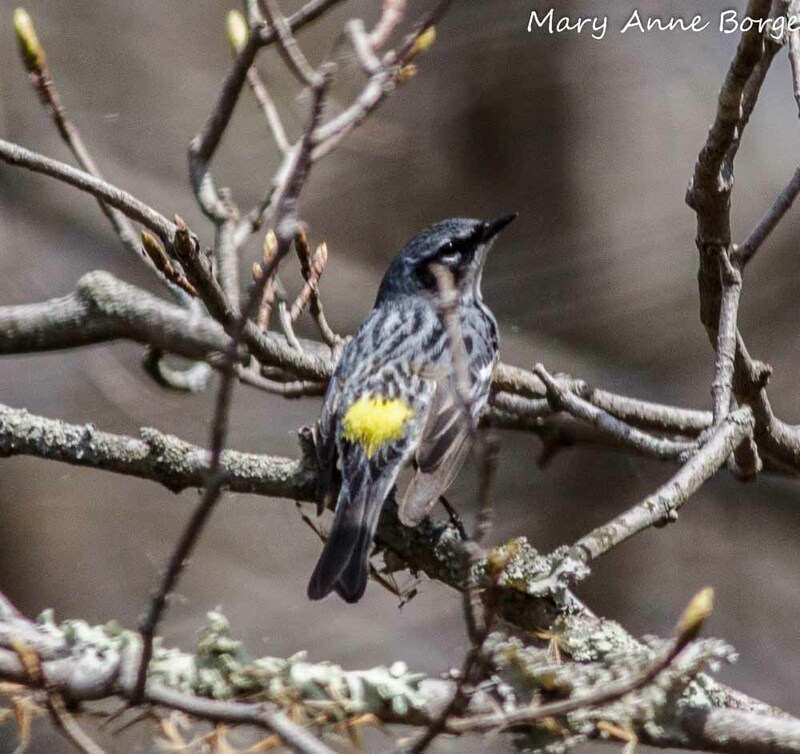 Yellow-rumped Warblers were the first and most plentiful of the migrants we spotted. They were traveling in a pack, as they usually do. We saw Hermit Thrushes and Blue-gray Gnatcatchers, and heard, but didn’t see, a Black-throated Blue Warbler. 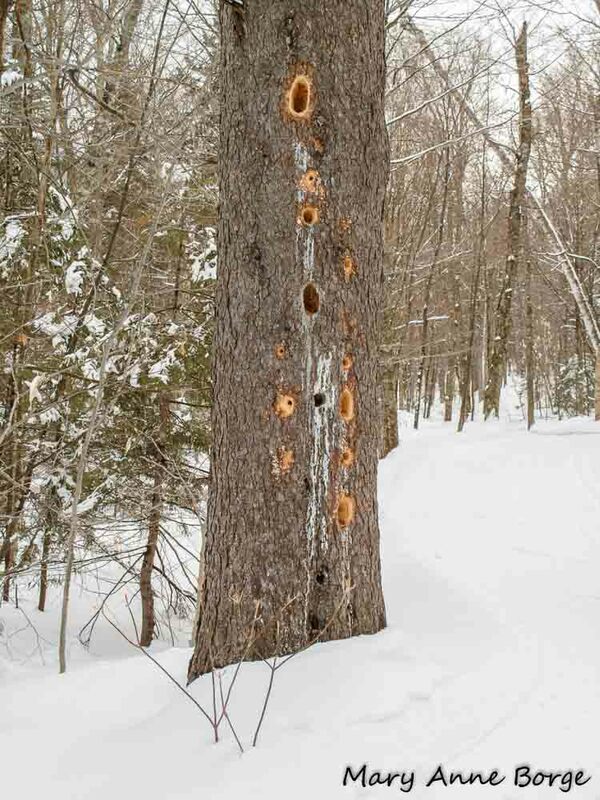 A Pileated Woodpecker put in an appearance, too. 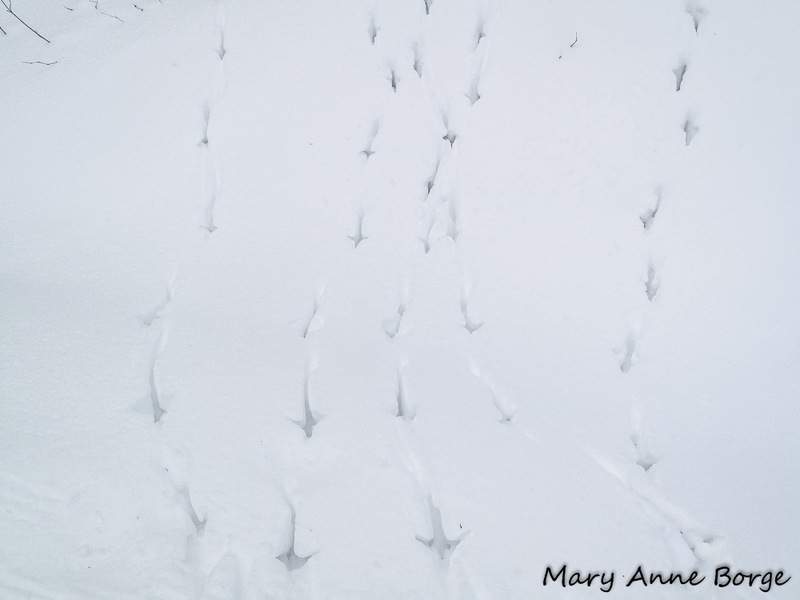 As mid-day approached, bird activity increased. 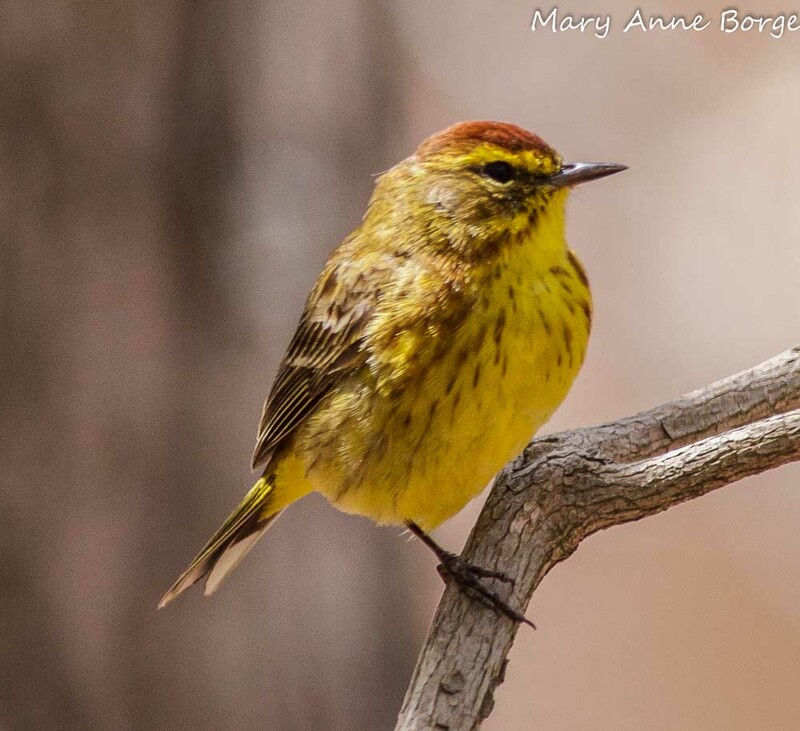 A Palm Warbler posed for us. 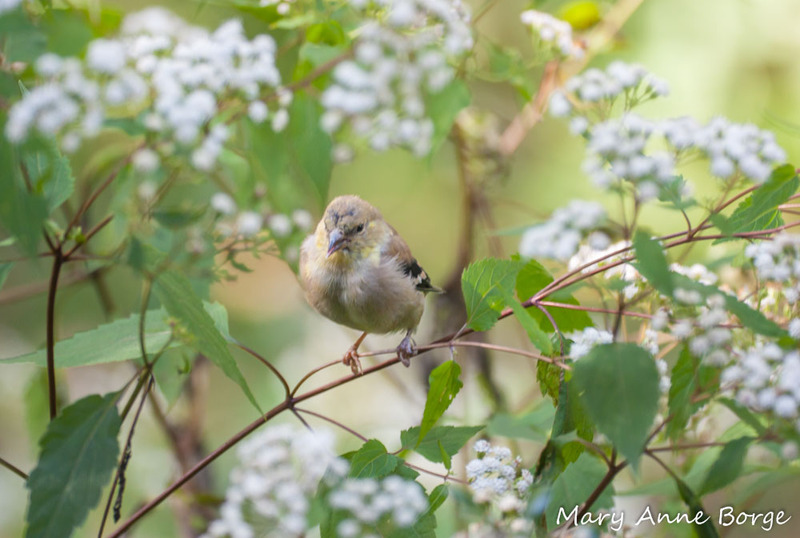 The bird returned to the business of foraging for food, snatching and whacking its caterpillar prey against the branch, then quickly gulping it down. Yum! 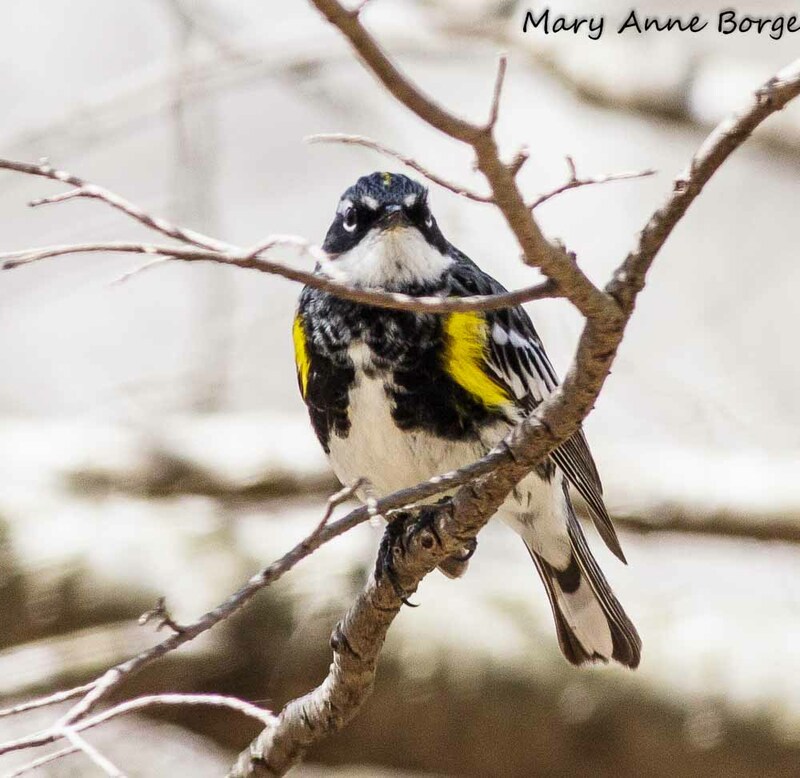 Black-and-white Warblers appeared, and a Blue-headed Vireo was busy hunting for lunch, moving from branch to branch, tree to tree. 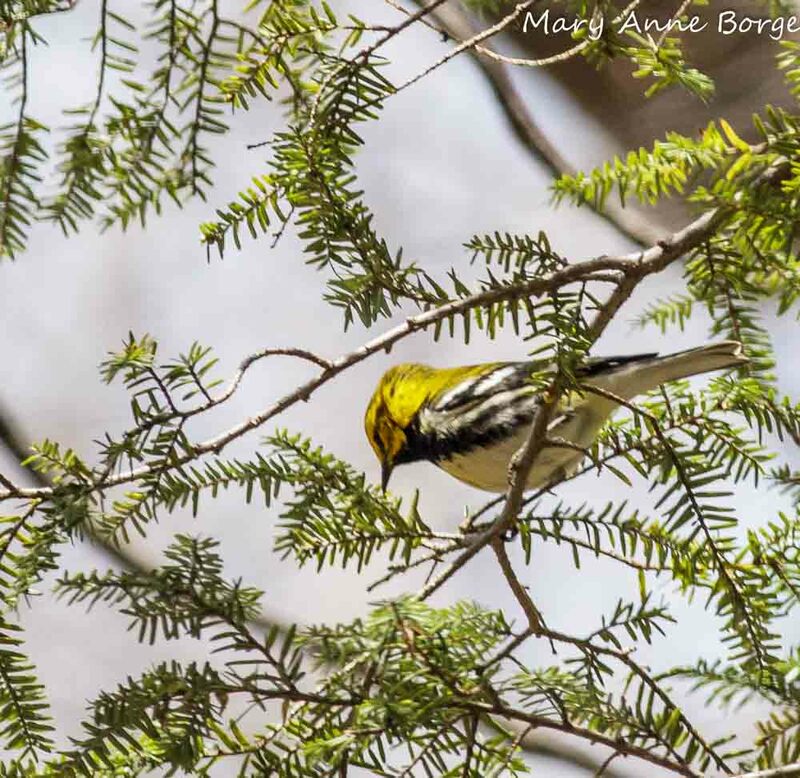 A Black-throated Green Warbler peered out from the shelter of a Hemlock tree. Then he returned to his search for food. With wind and rain predicted for the next few days, there could be some interesting fall-outs of migrants. 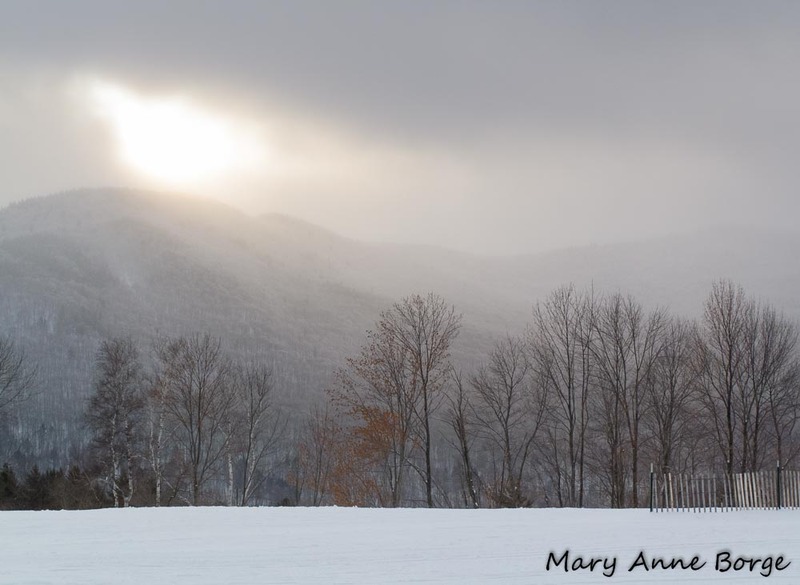 There aren’t many leaves on the trees yet, so viewing opportunities are maximized. Could be a good birding weekend ahead!